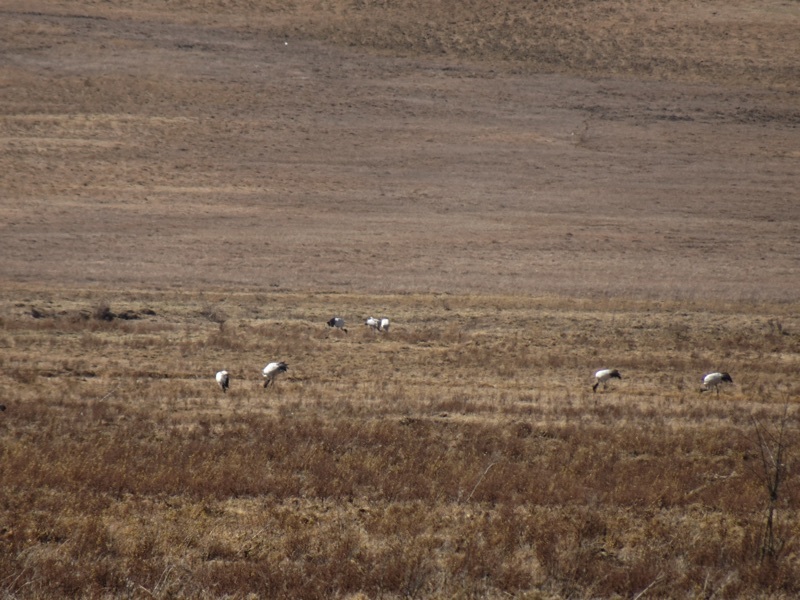 On our way back to our hotel after visiting the Crane Center, we saw a cluster of birds fussing and fighting on the ground across the wetlands. 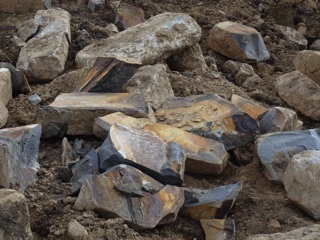 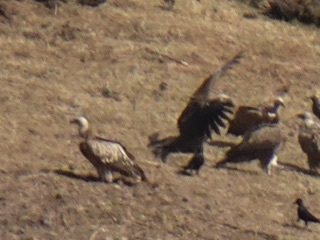 Some were Himalayan griffins. 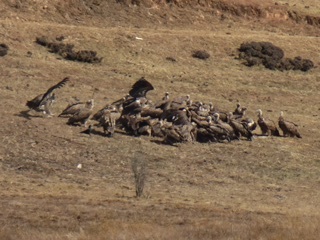 Obviously, something had died and attracted notice. 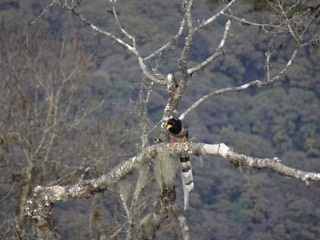 We watched for a bit, then headed on, back to Amankora. 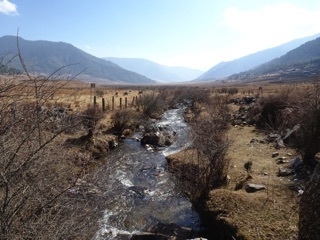 Yet another stream - These are wetlands. 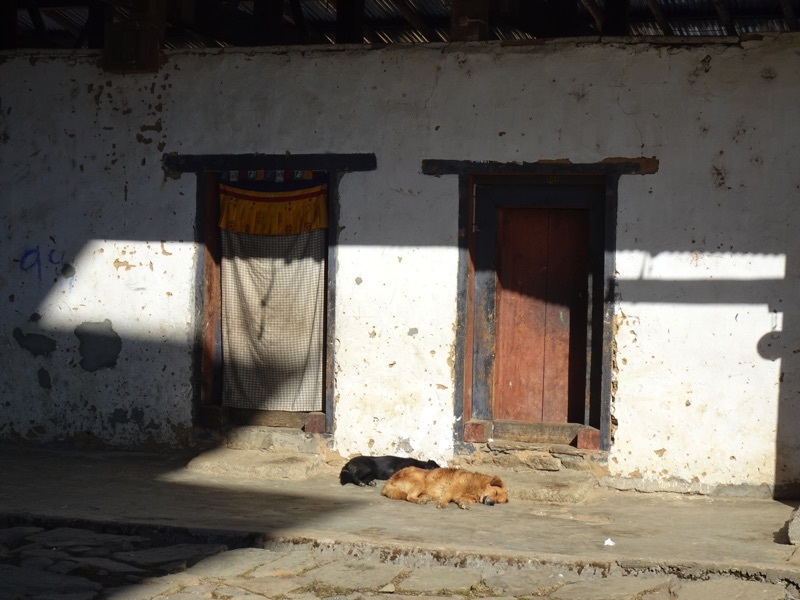 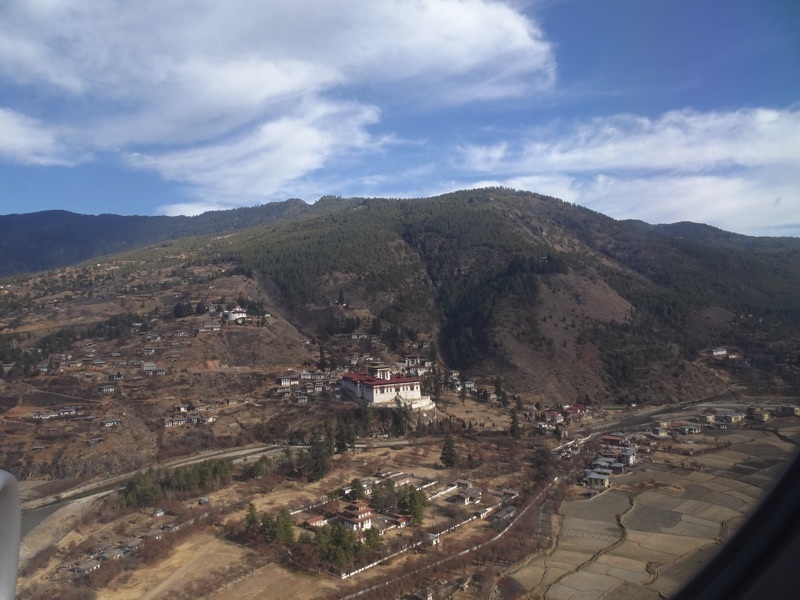 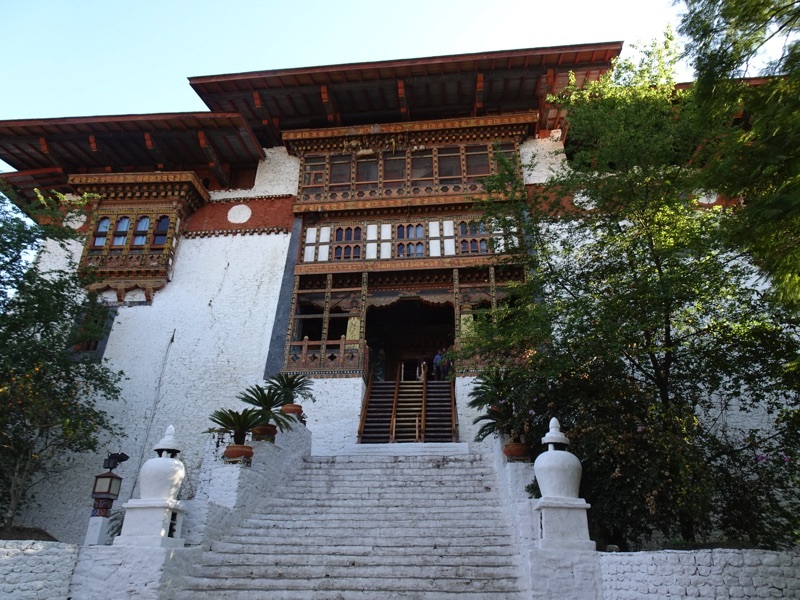 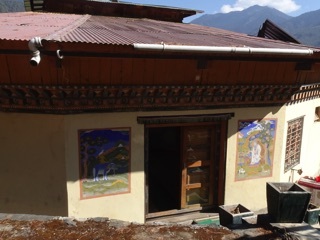 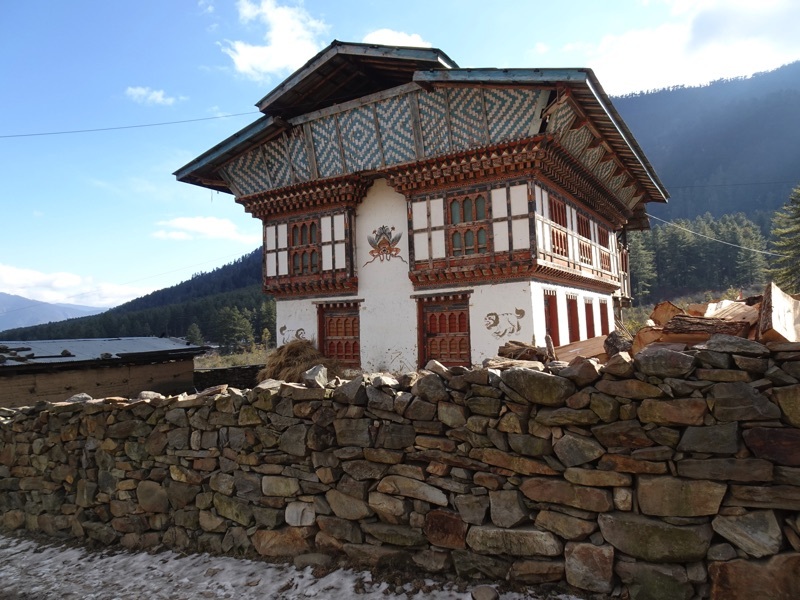 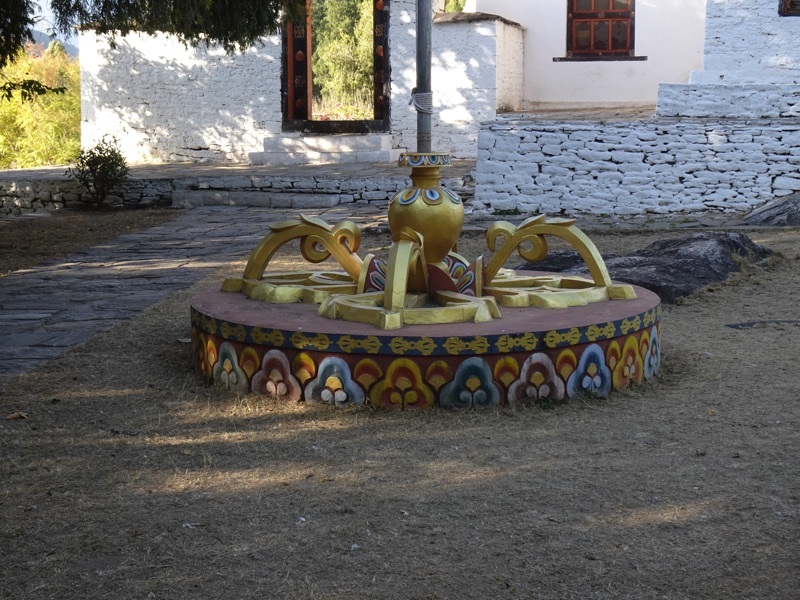 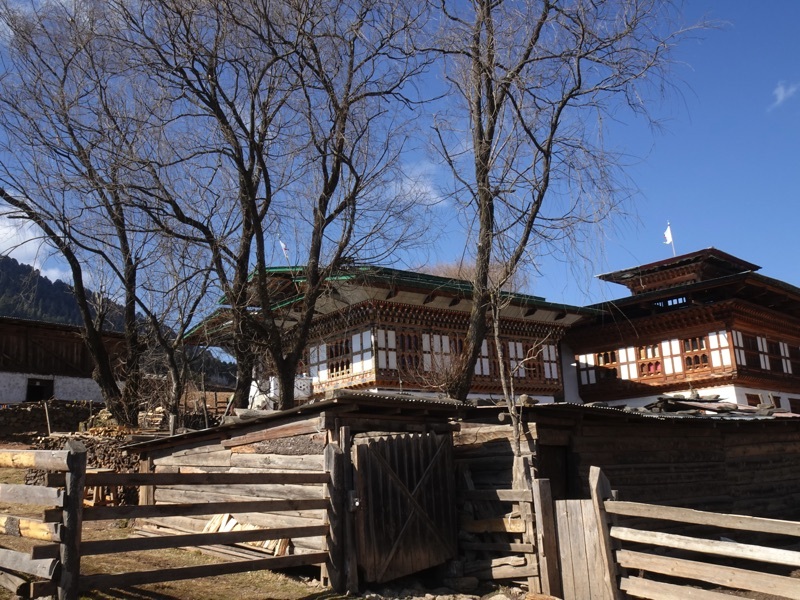 As much as we hated to leave Amankora Gangtey, we set out to the local dzong, the monastery on the hill across the valley. The monastery was fascinating enough, but then we headed through the adjacent village, down and into the pine forest on the monastery hill. 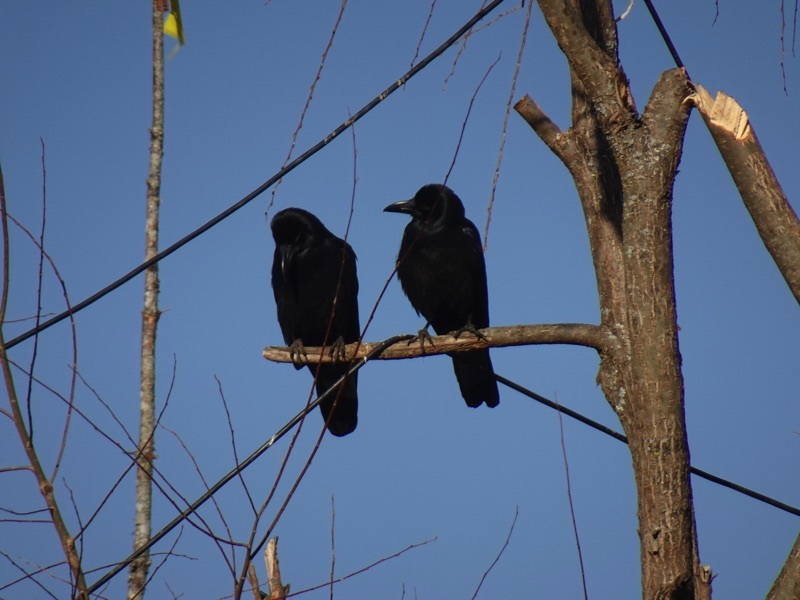 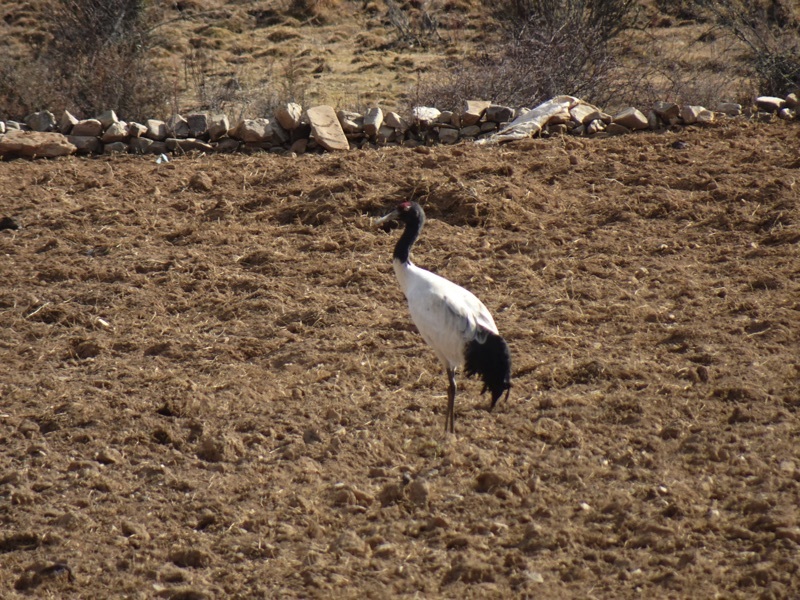 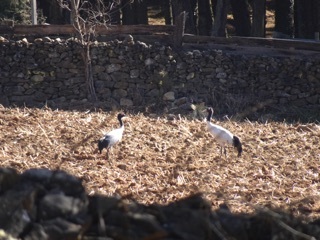 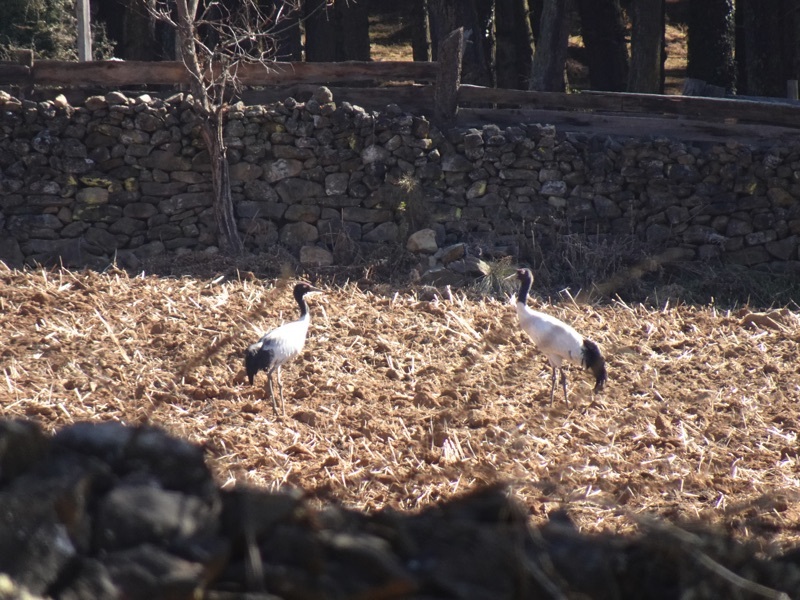 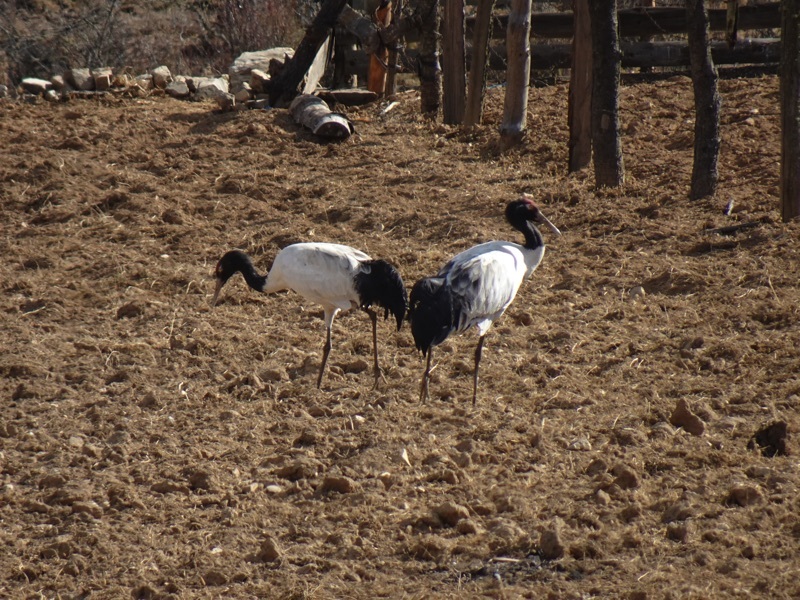 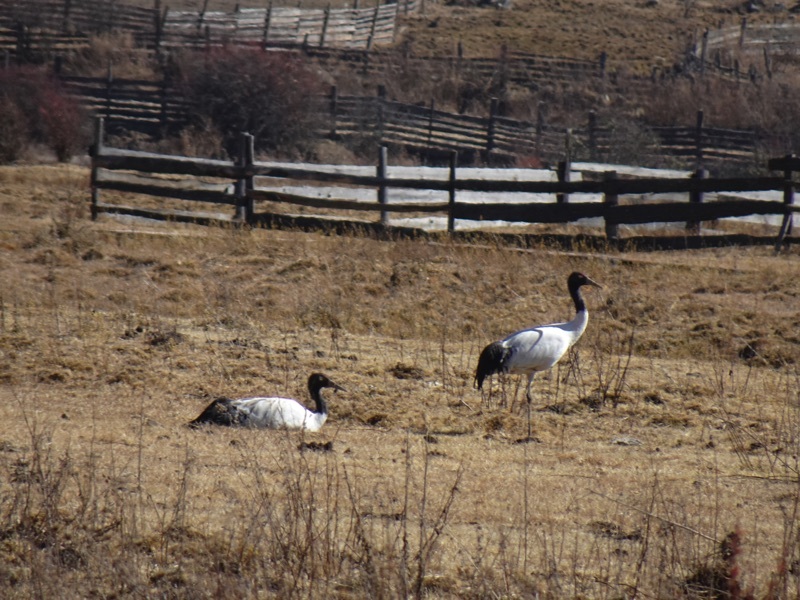 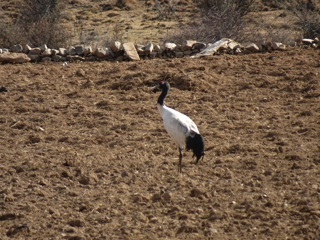 We saw black necked cranes in the fields. They love that stubble. 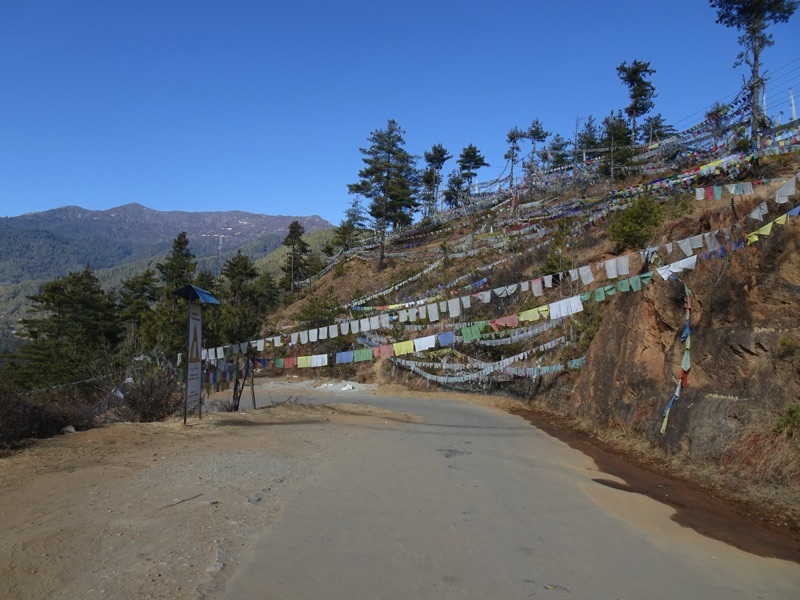 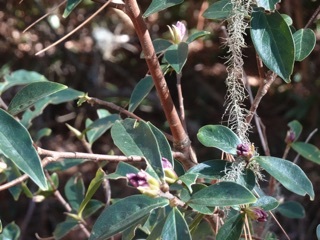 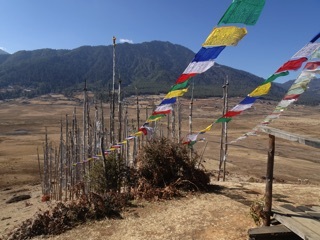 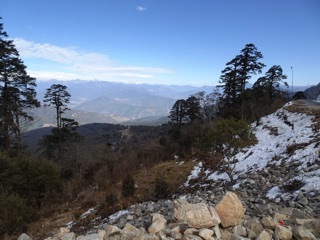 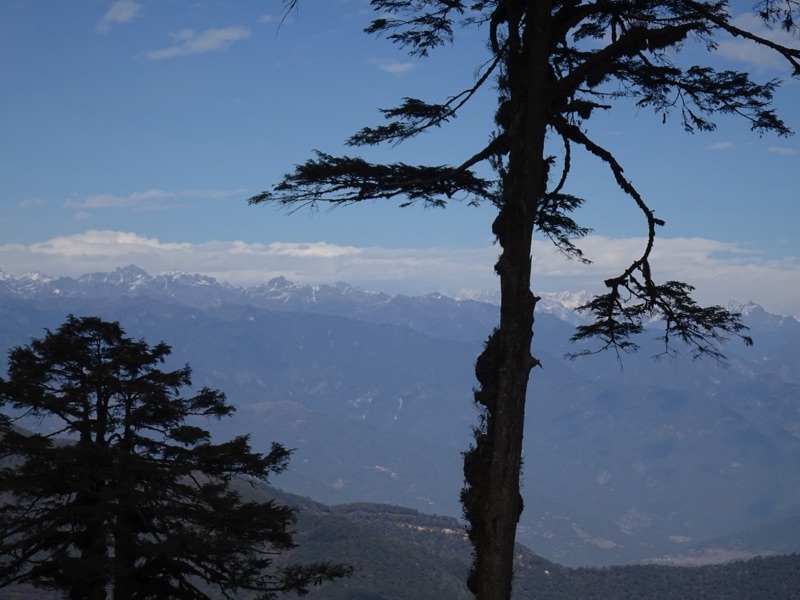 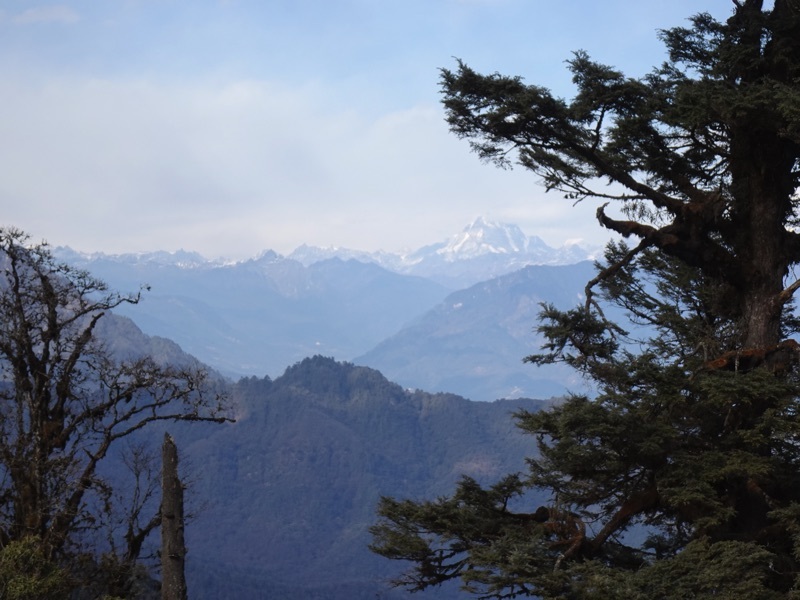 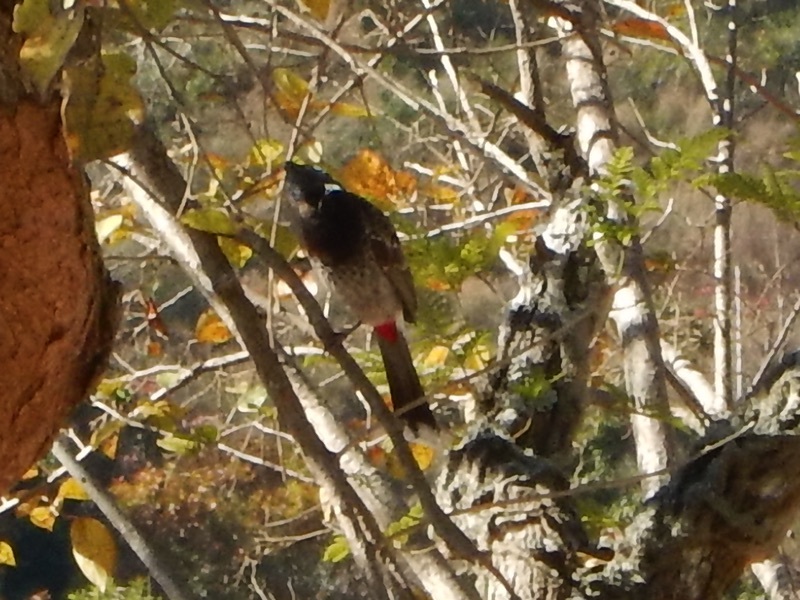 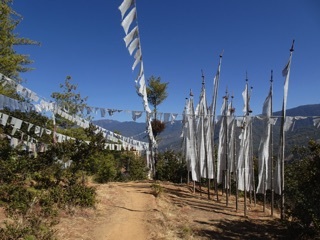 We walked through the forest, past daphnes and dwarf bamboo, and emerged to an overlook adorned with prayer flags. 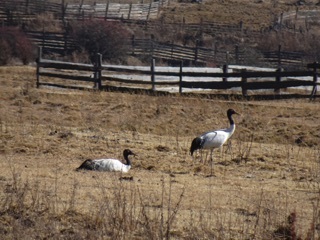 There were black necked cranes in the wetlands below. 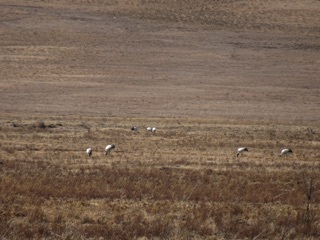 Then we made our way down to the wetlands, crossing on a cow damaged causeway and watching for cranes as we went. 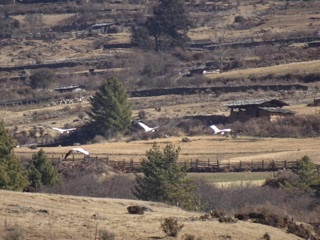 We saw some flying and as we followed the road we saw many others, some nearby and some in the distance. 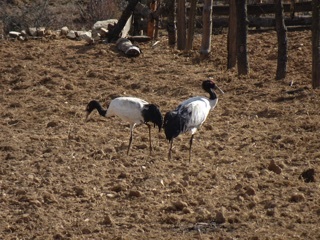 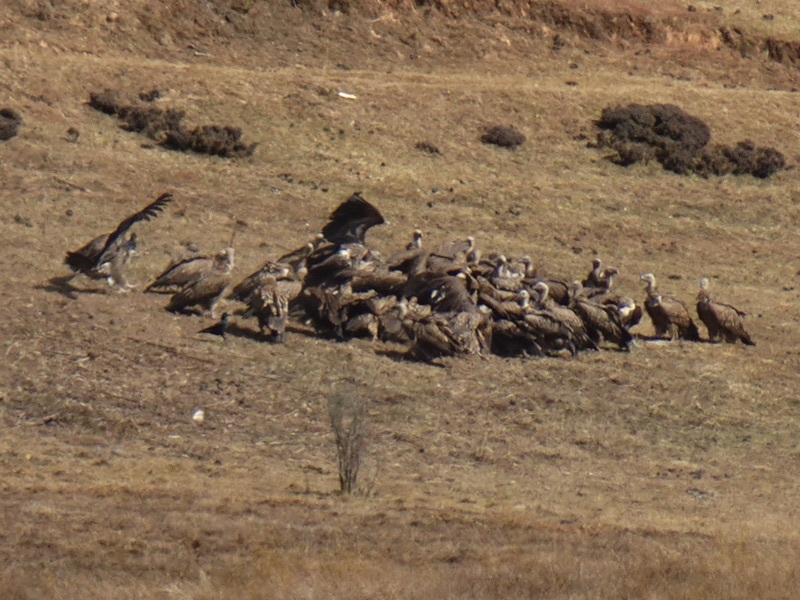 Apparently, this has been a great year for the black necked cranes. 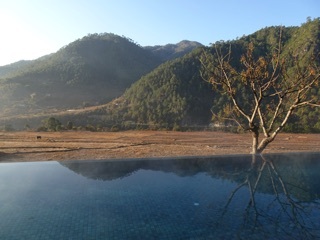 Amankora Gangtey - Why would we ever leave? 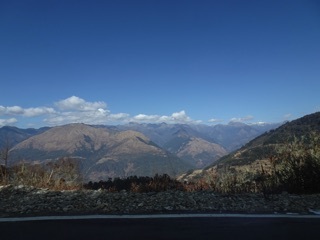 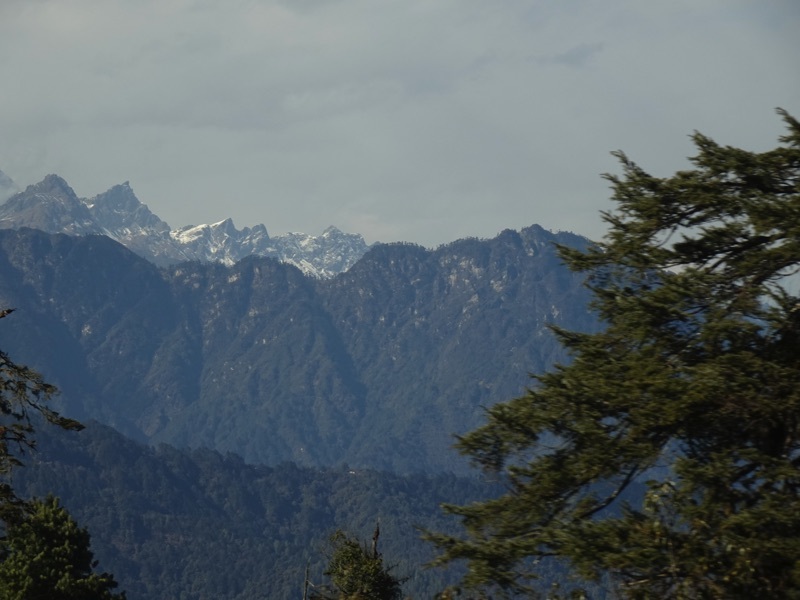 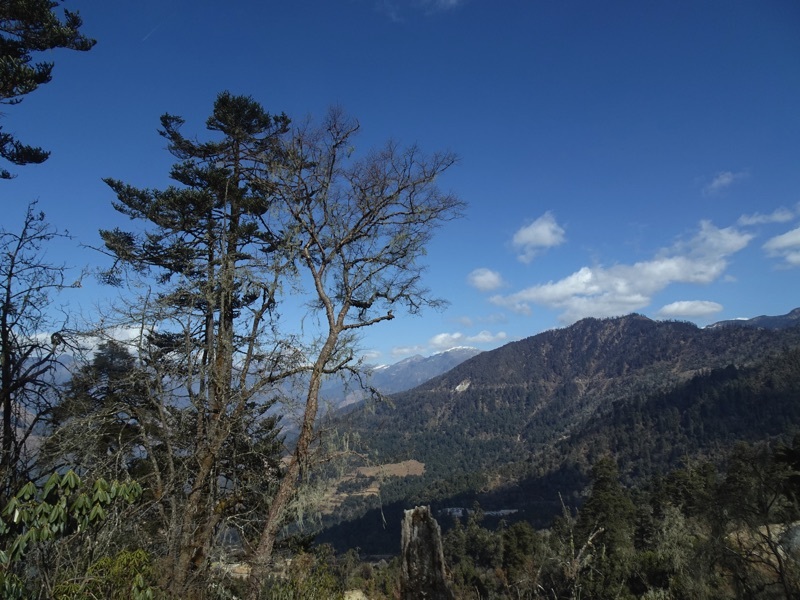 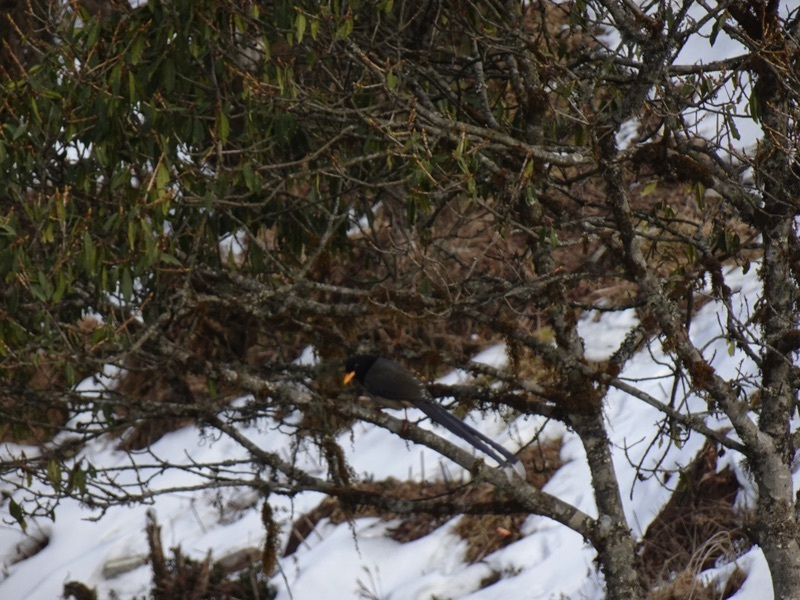 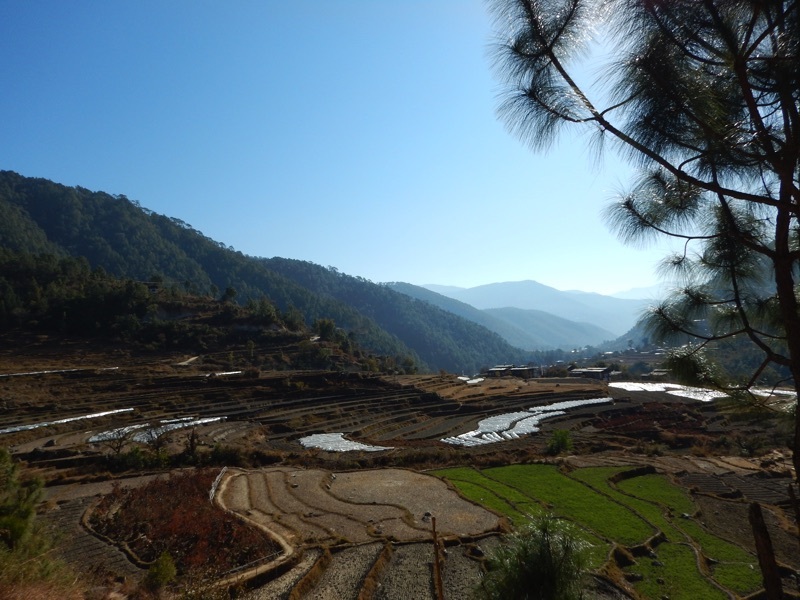 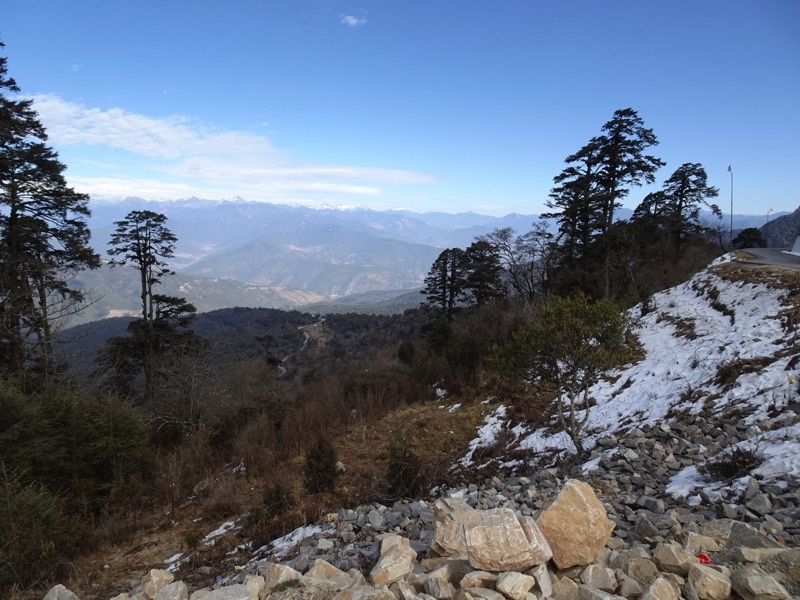 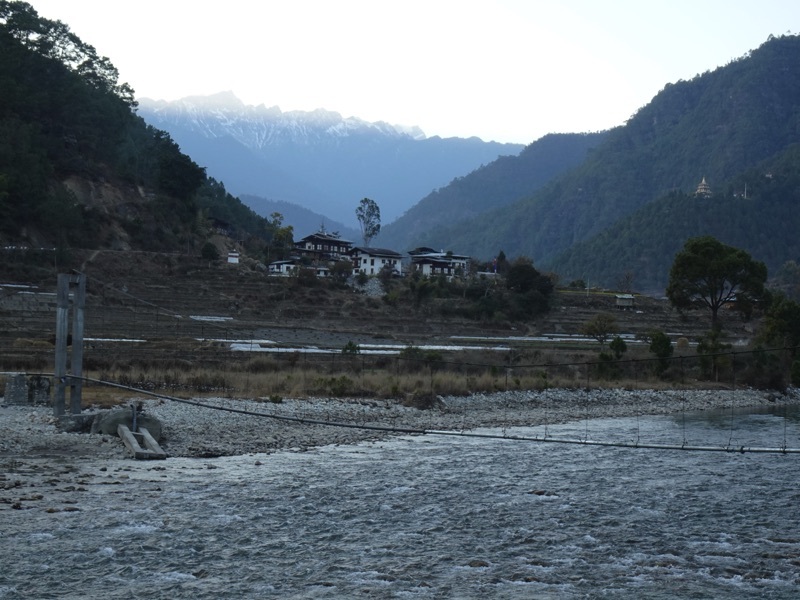 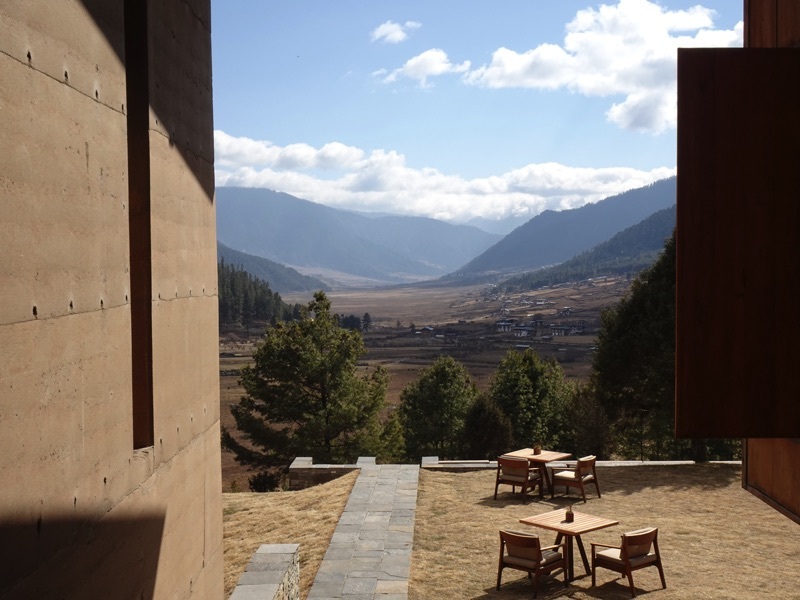 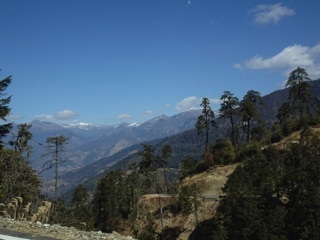 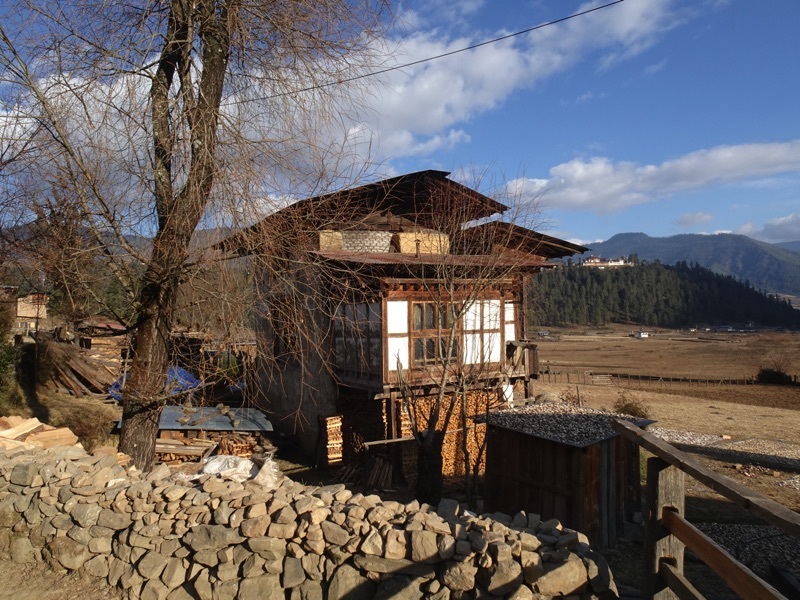 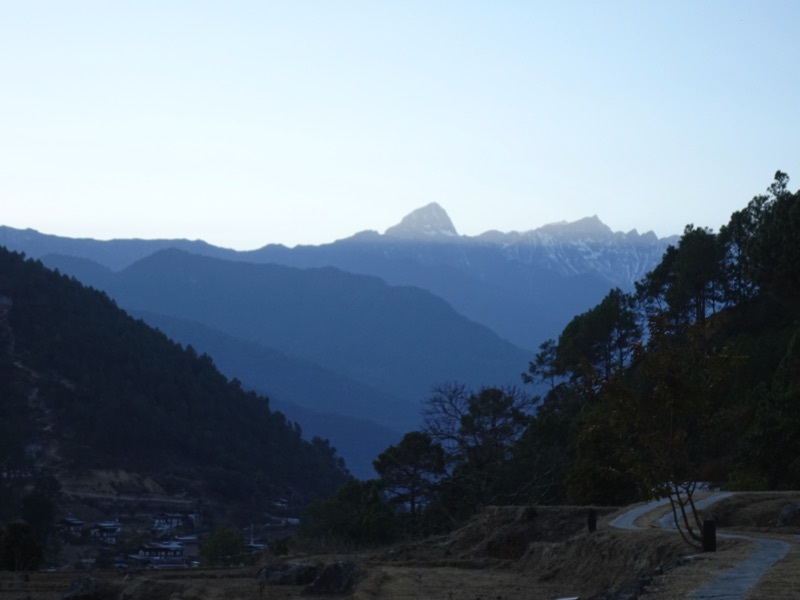 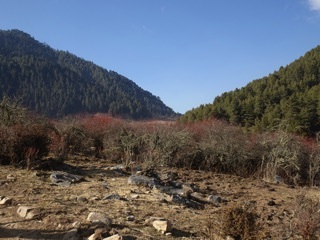 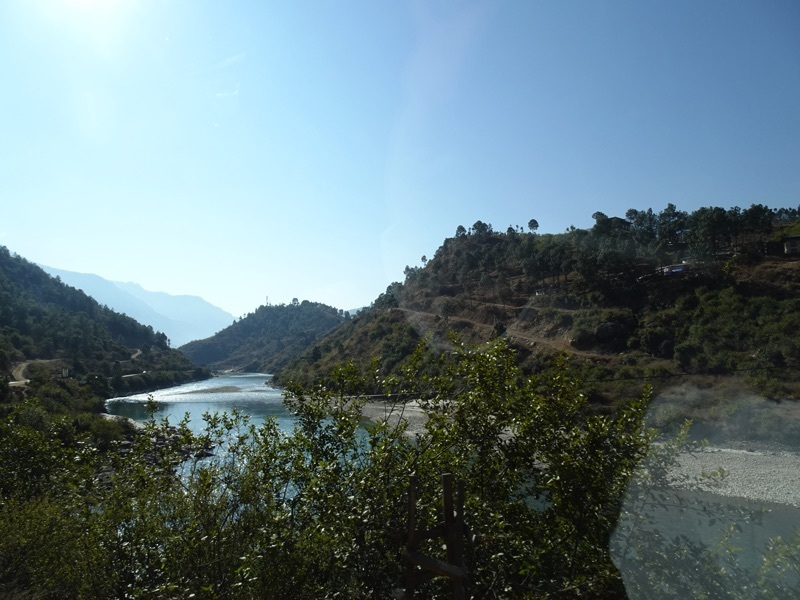 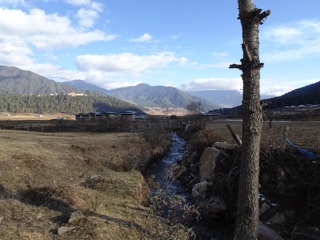 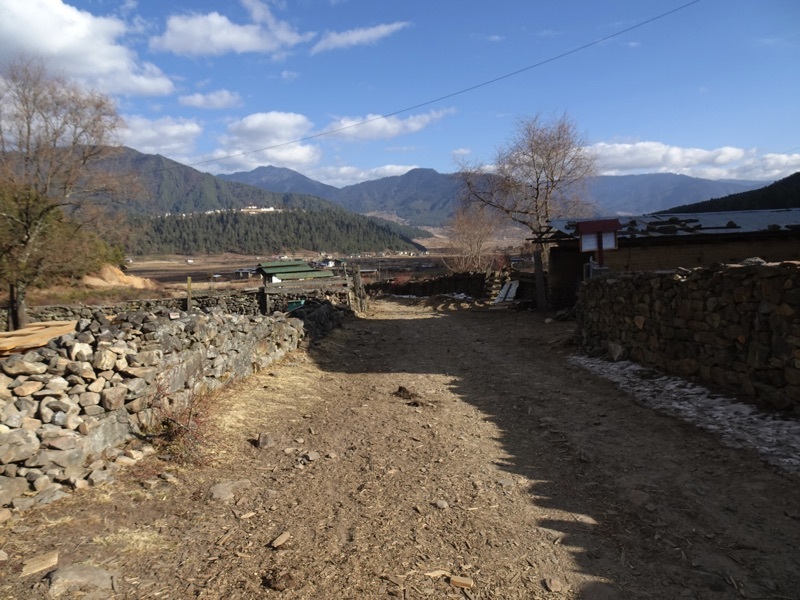 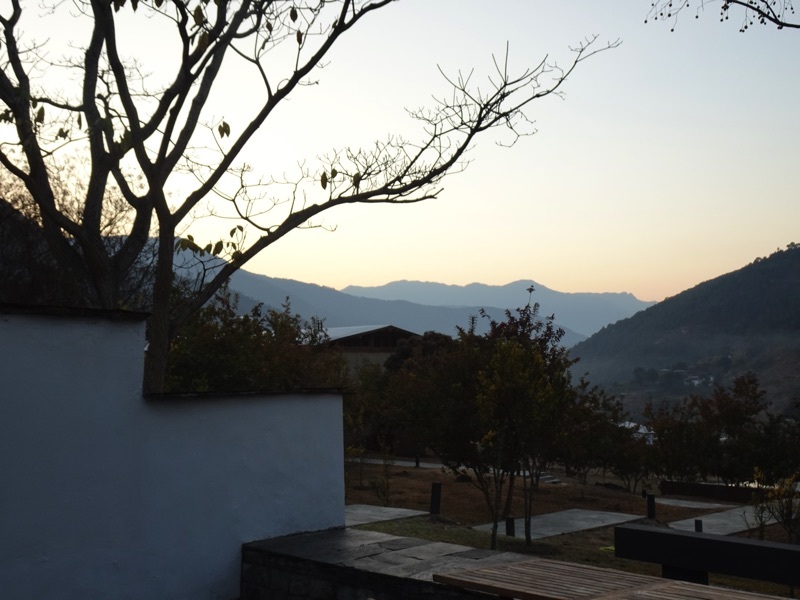 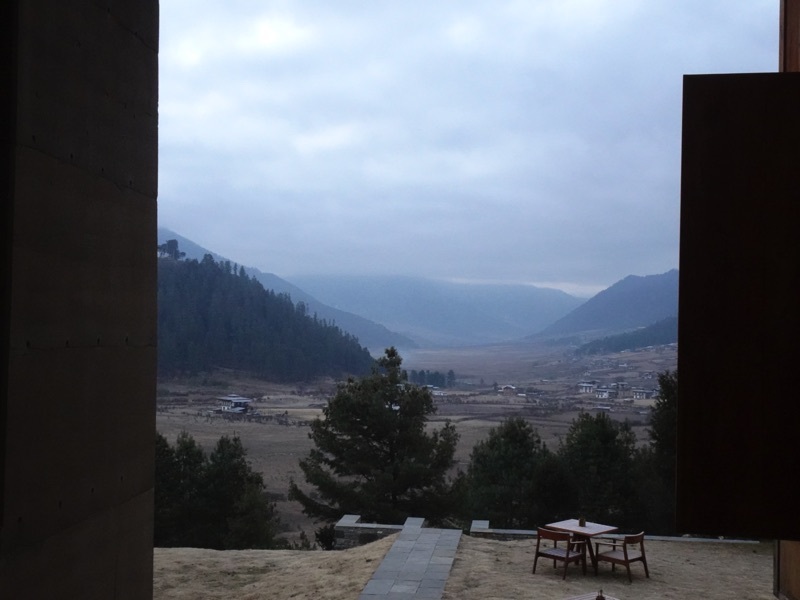 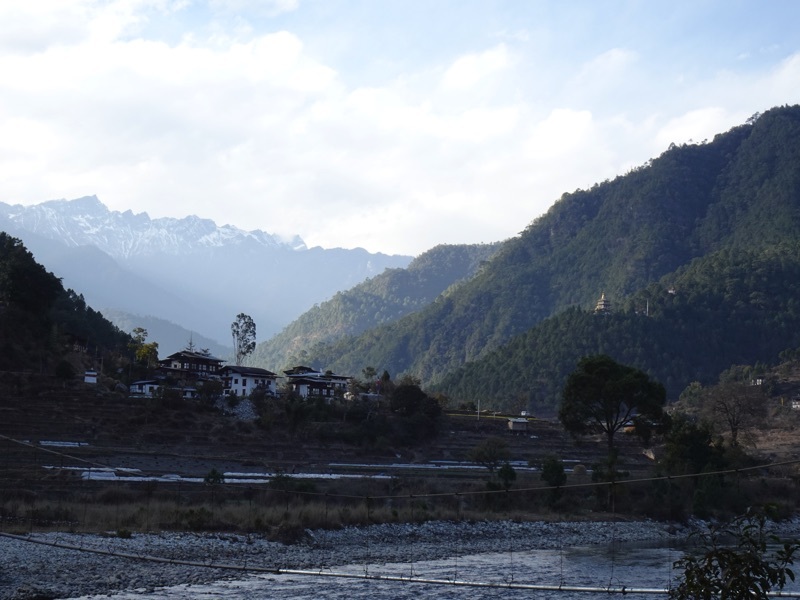 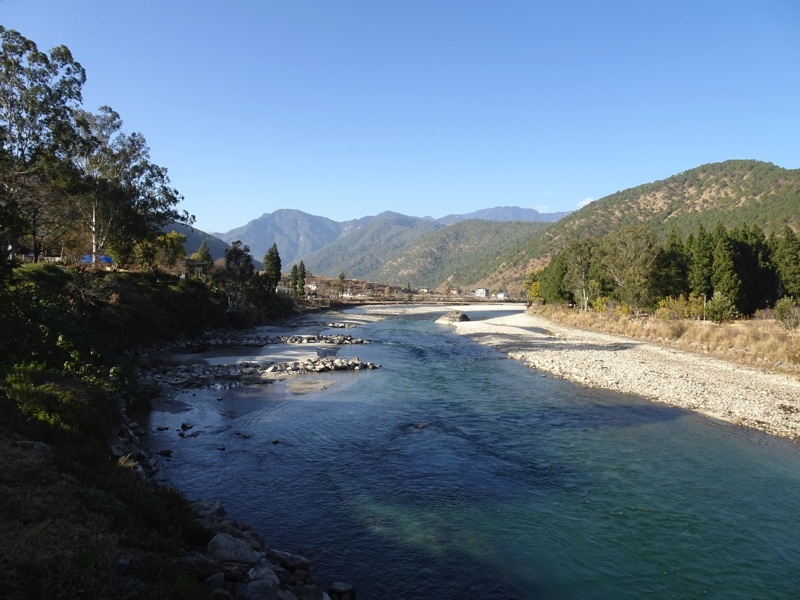 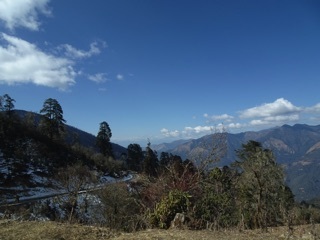 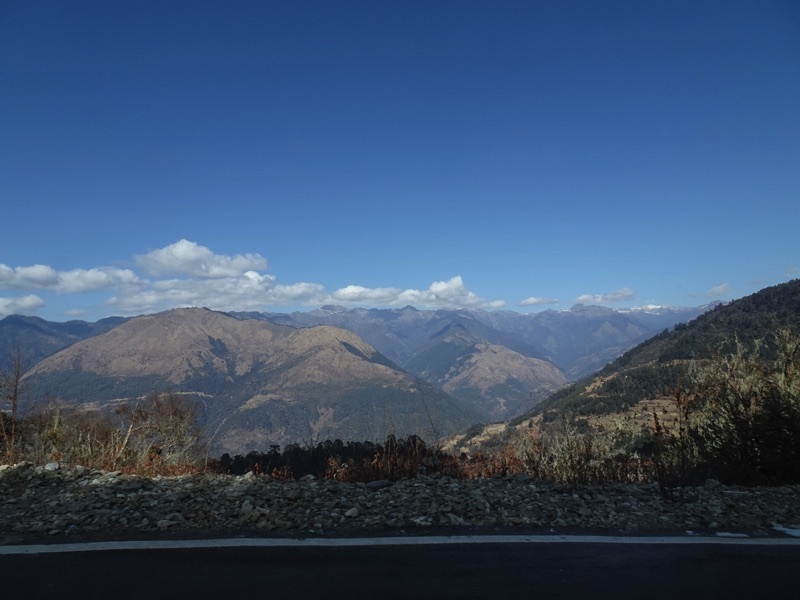 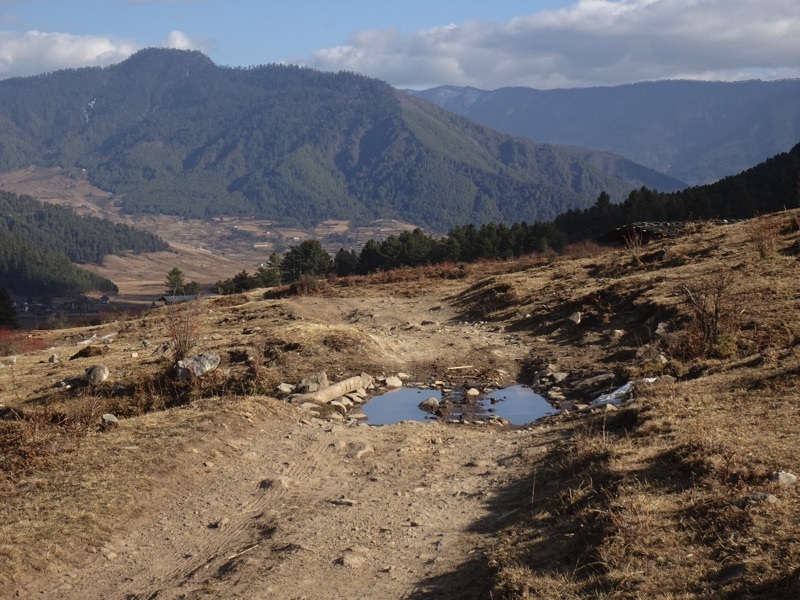 We left Punakha, and once again were on a winding mountain road riding through wild forest with snow capped hills in the distance and glimpses of rivers far below. 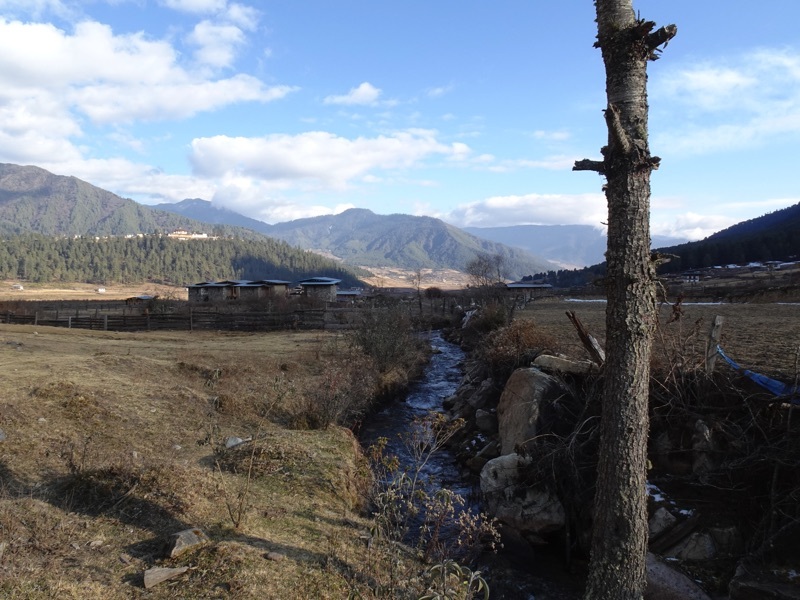 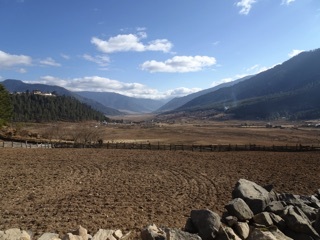 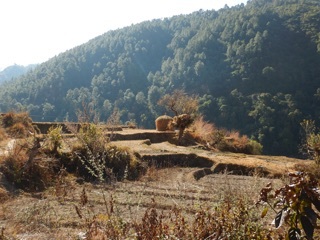 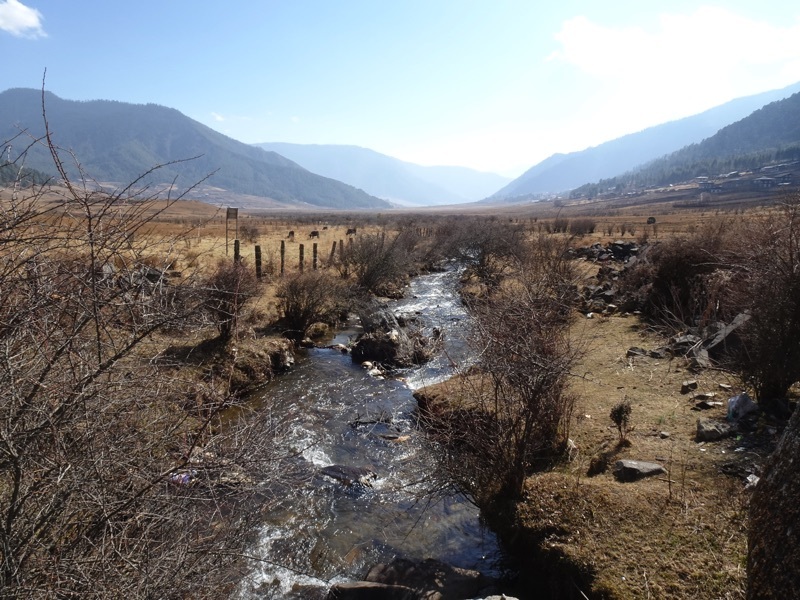 We followed Bhutan’s east-west highway, then turned south to the Pobjikha Valley and Gangtey, beautiful isolated farm country. 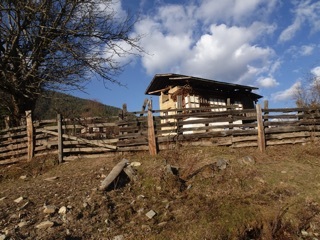 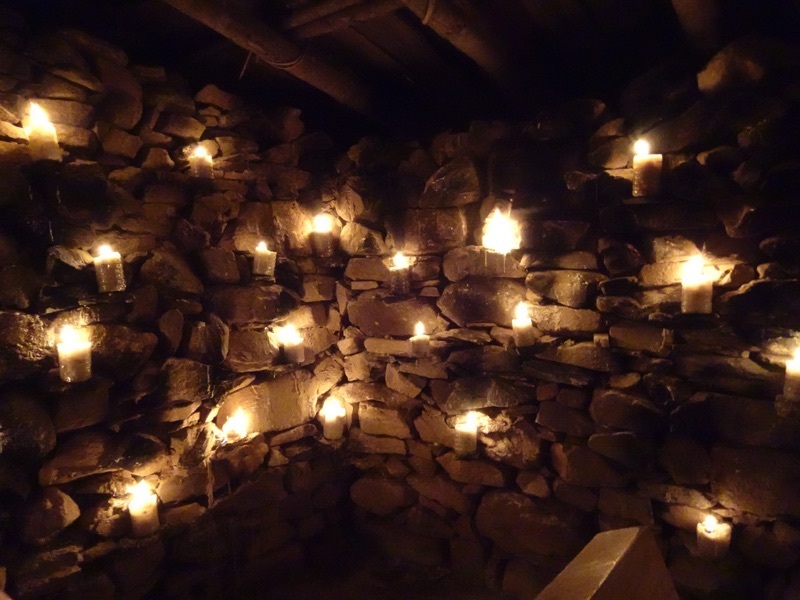 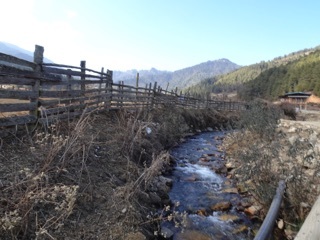 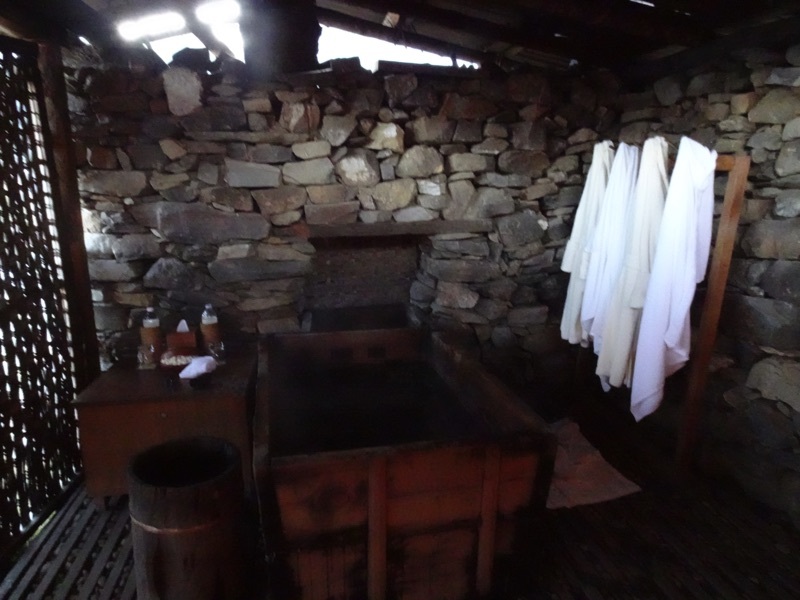 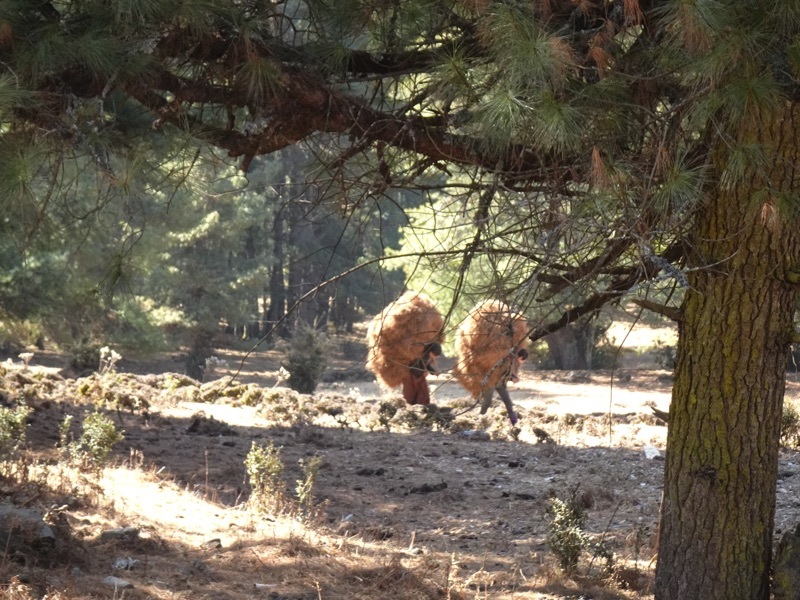 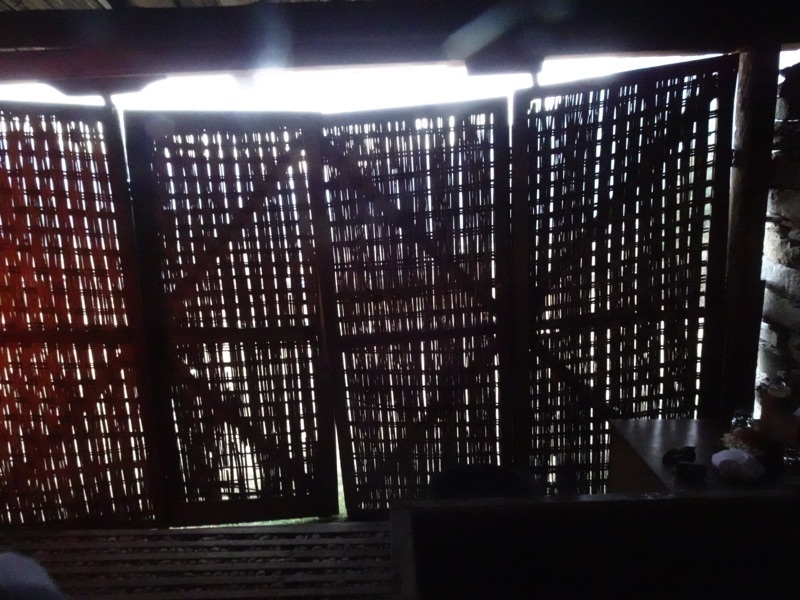 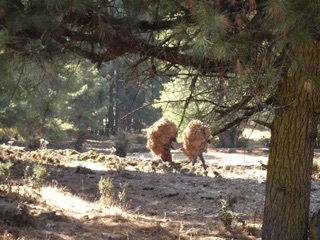 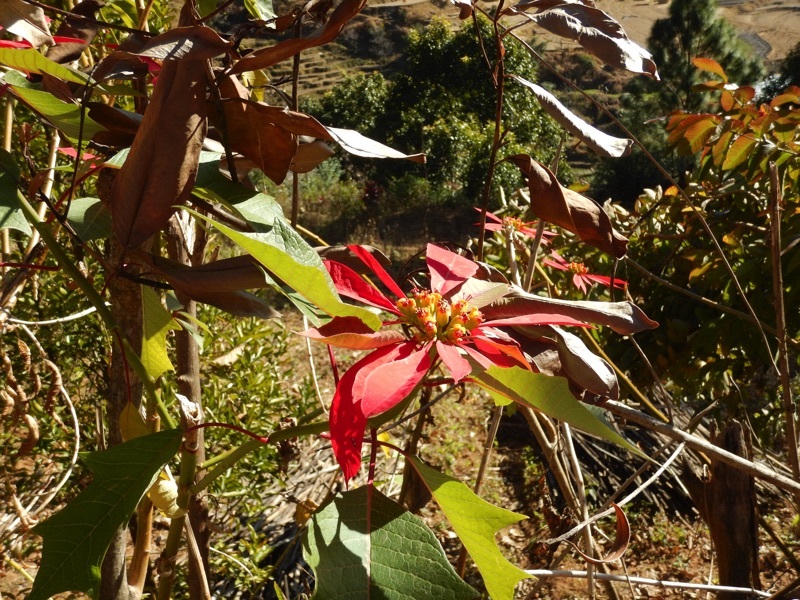 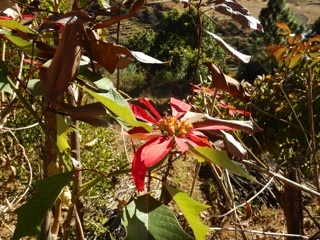 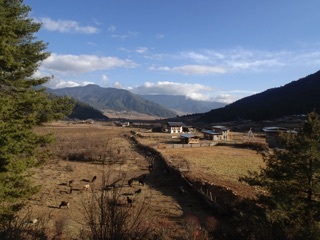 We had no sooner settled into the Amankora there than we took a walk from the hotel through the countryside. 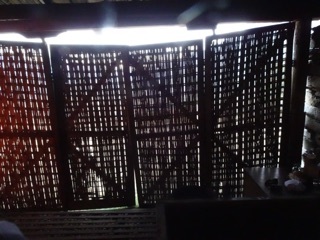 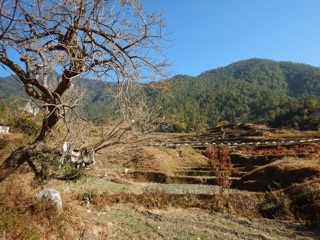 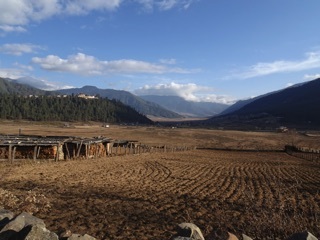 We went through a farm village, past drying turnips, half wild cattle and black necked cranes. 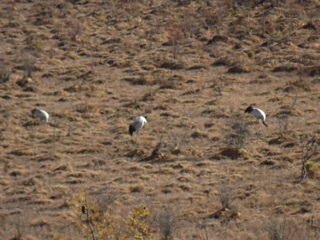 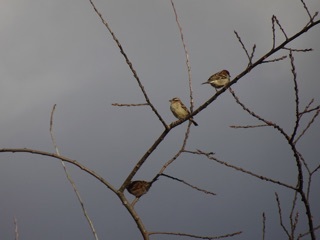 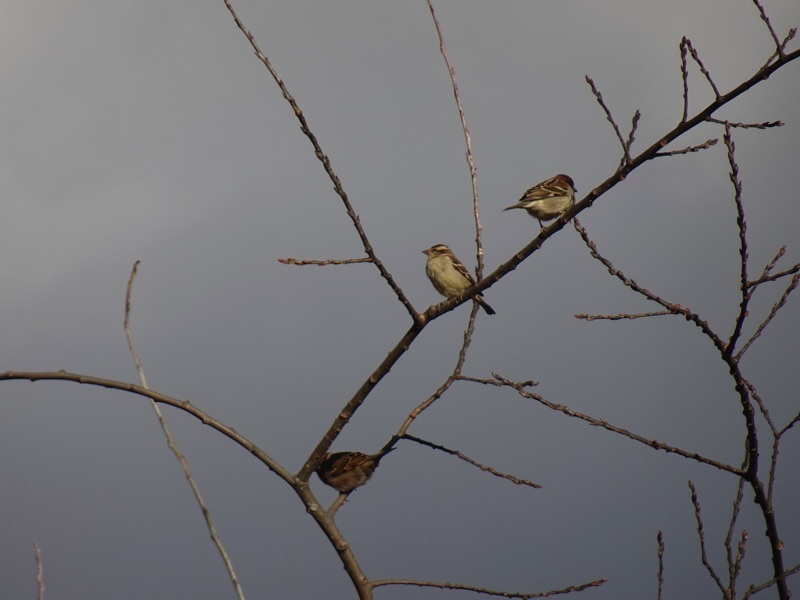 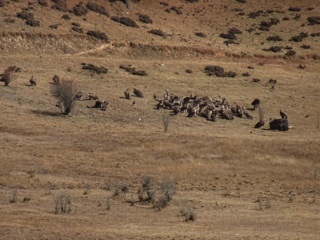 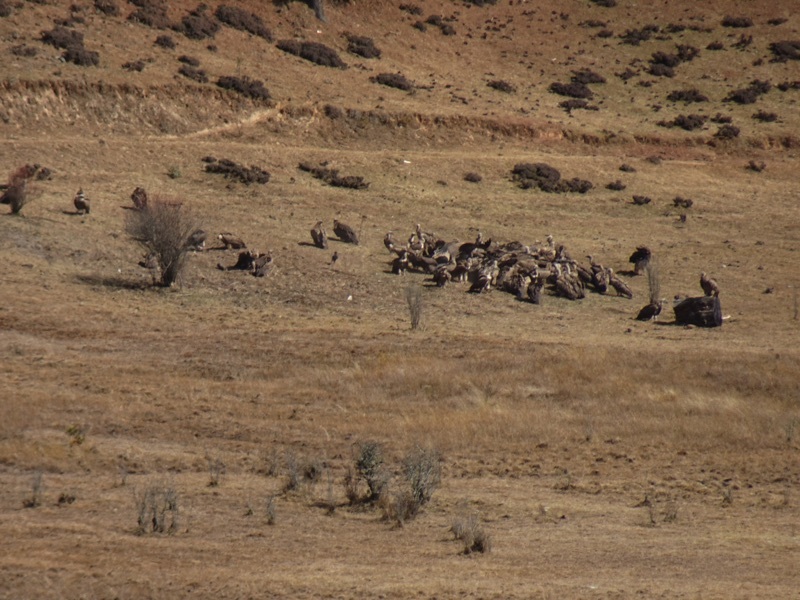 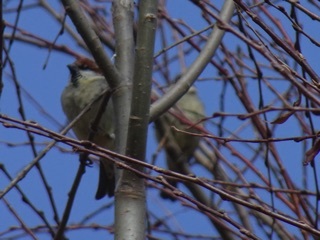 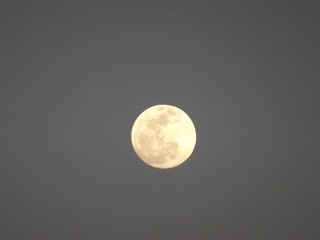 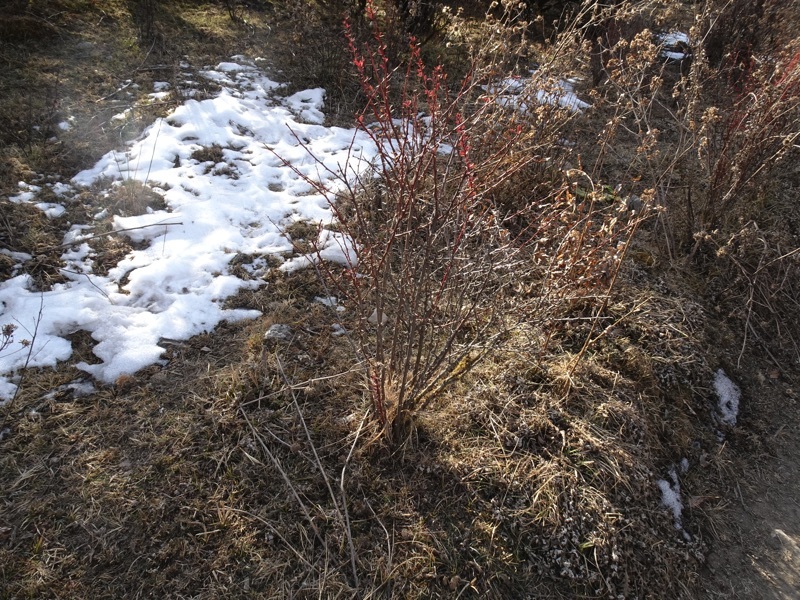 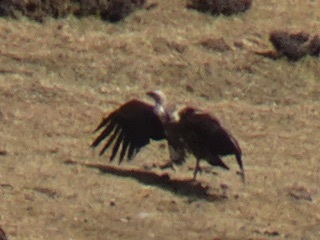 Yes, there they were, wintering in the wetlands of the valley and foraging on the crop stubble. 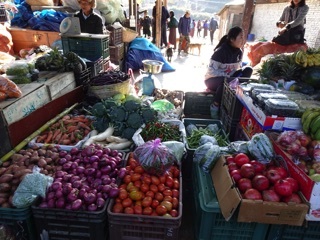 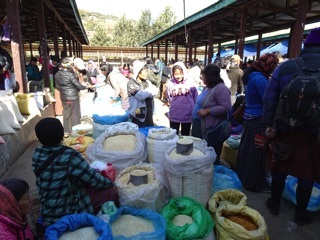 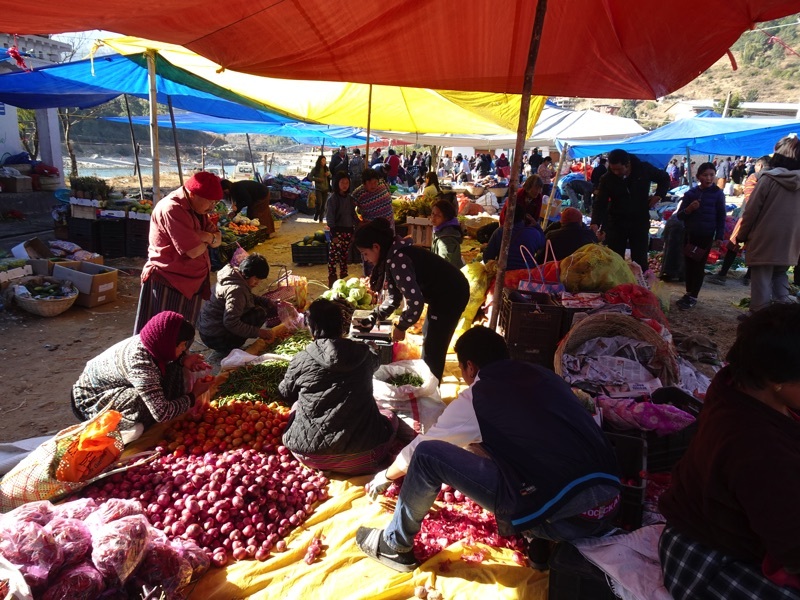 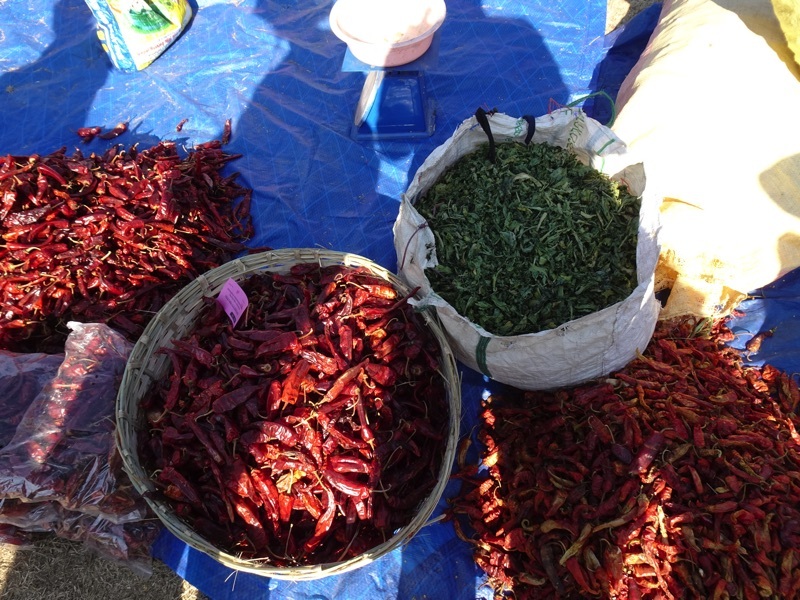 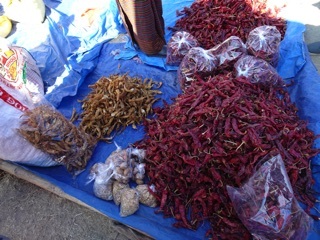 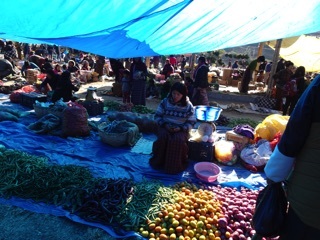 We checked out the local farmers’ market in Punakha. 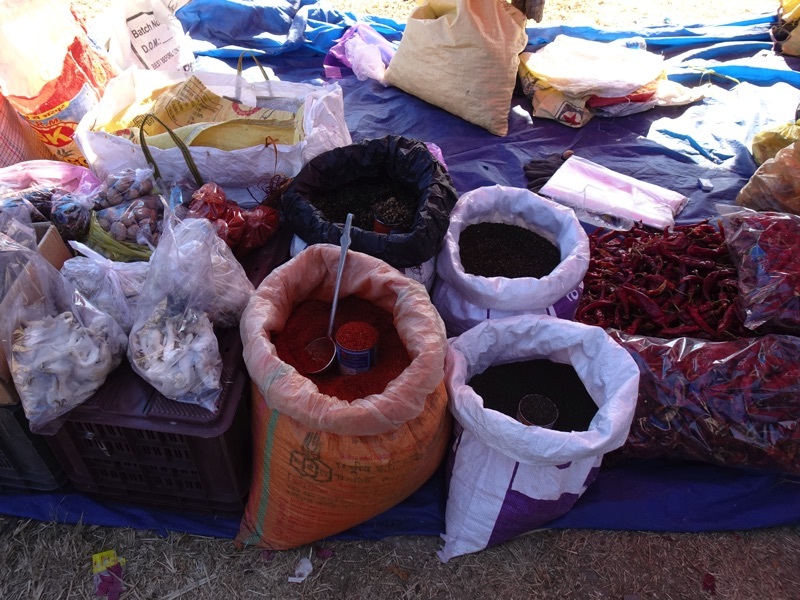 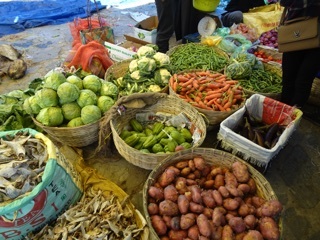 It’s held every Saturday morning and is full of local produce, rice, vegetables, betelnut, cabbages, potatoes and so on. 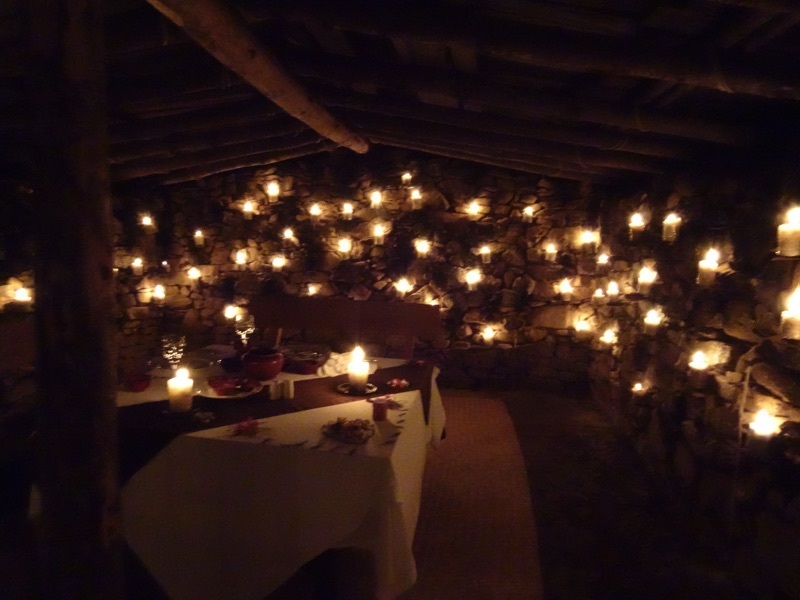 We were sorry we didn’t have a kitchen or we would have gone crazy there. 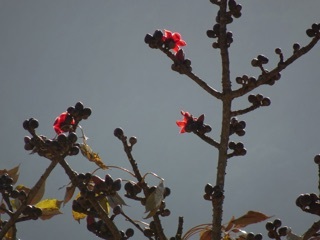 Bhutan may be in the Himalayas but it is not much farther north than Hawaii, so it has wonderful produce. 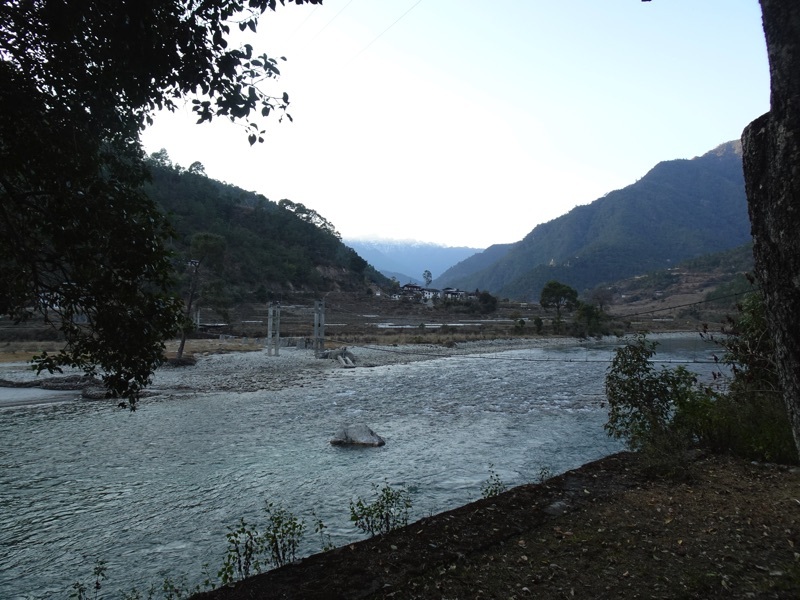 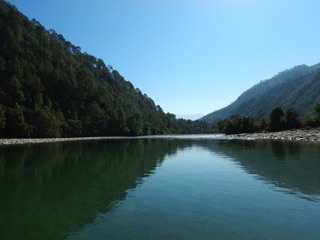 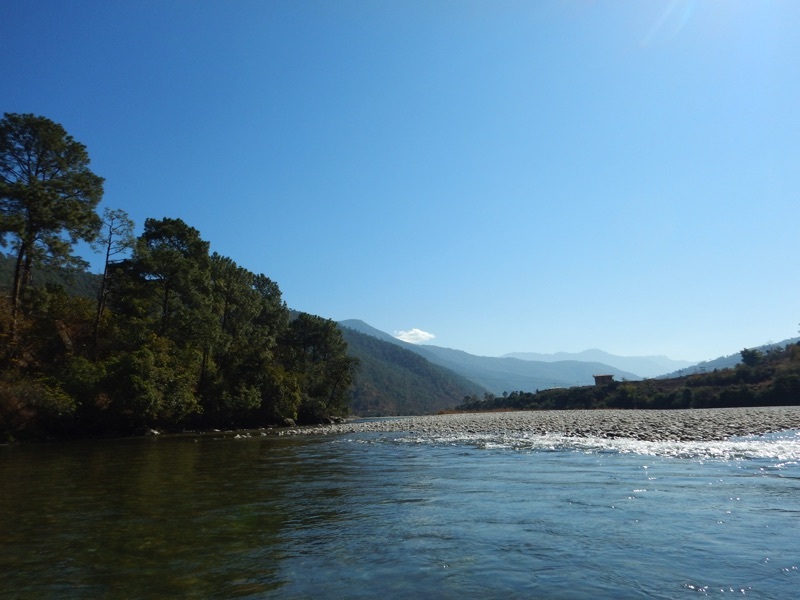 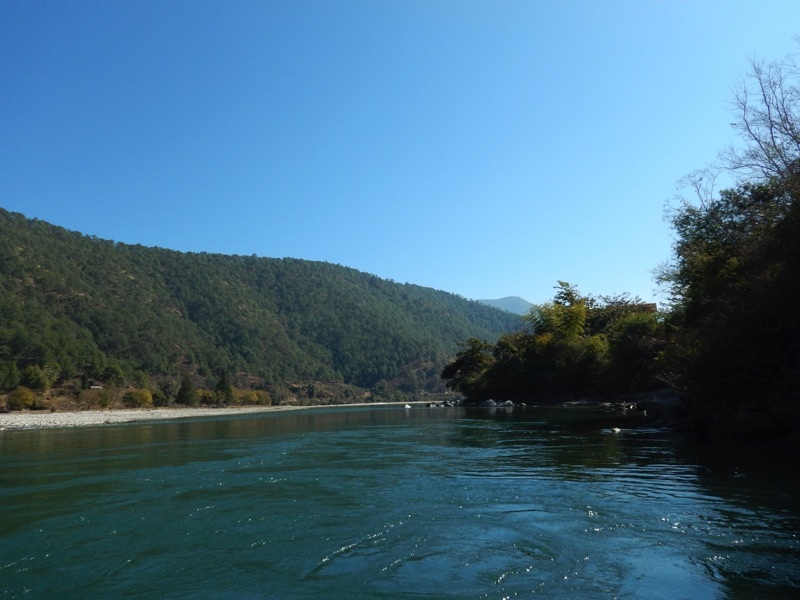 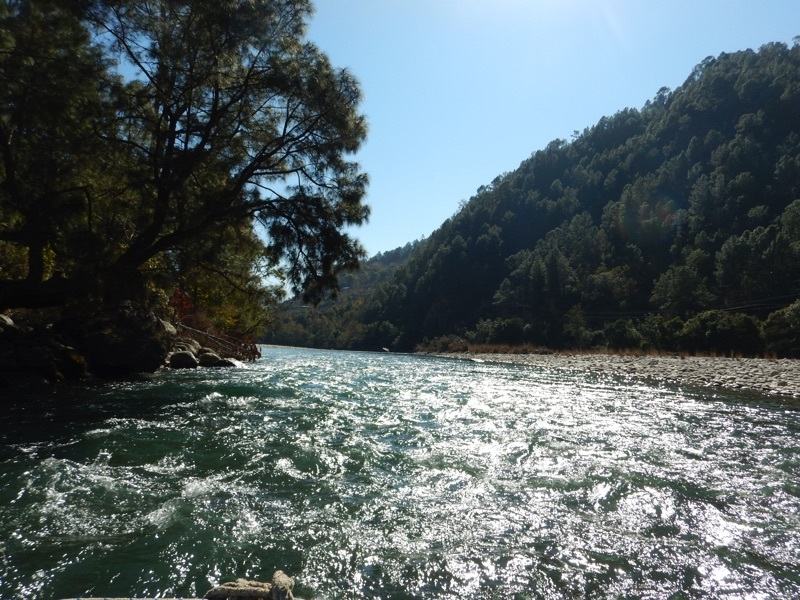 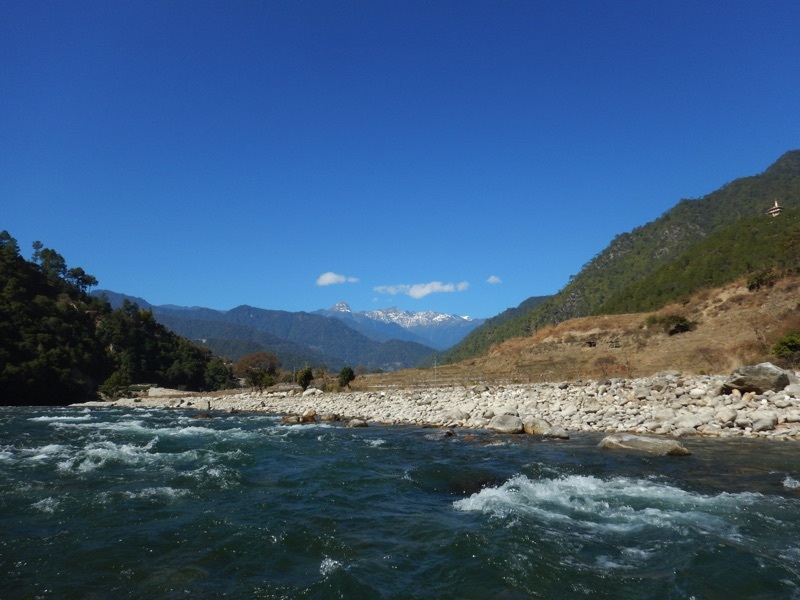 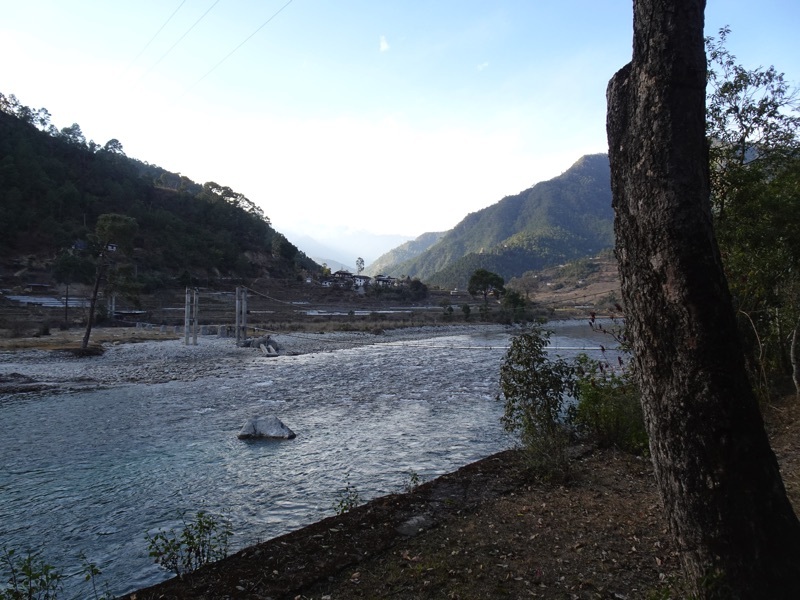 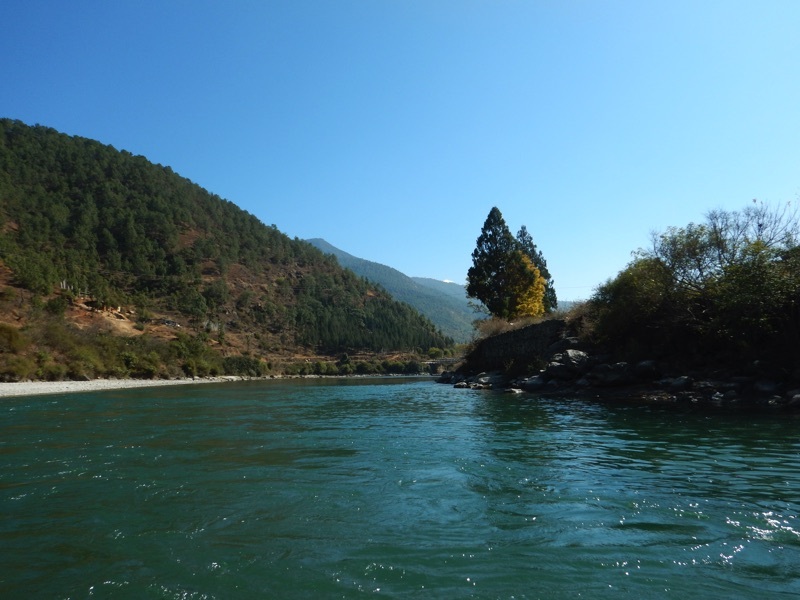 We took a rafting trip down the Female River that runs through Punakha. This was the gentler option than the Male River. 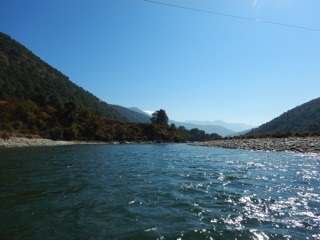 There were a few rapids, short stretches of white water, but this was not an adventure by anyone’s standards except our own. We had never been rafting before. We squeezed into wet suits and put on helmets. 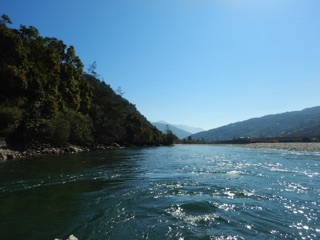 Then we boarded the raft and learned how not to hit each other or our guide with the paddles. That done, things went smoothly. 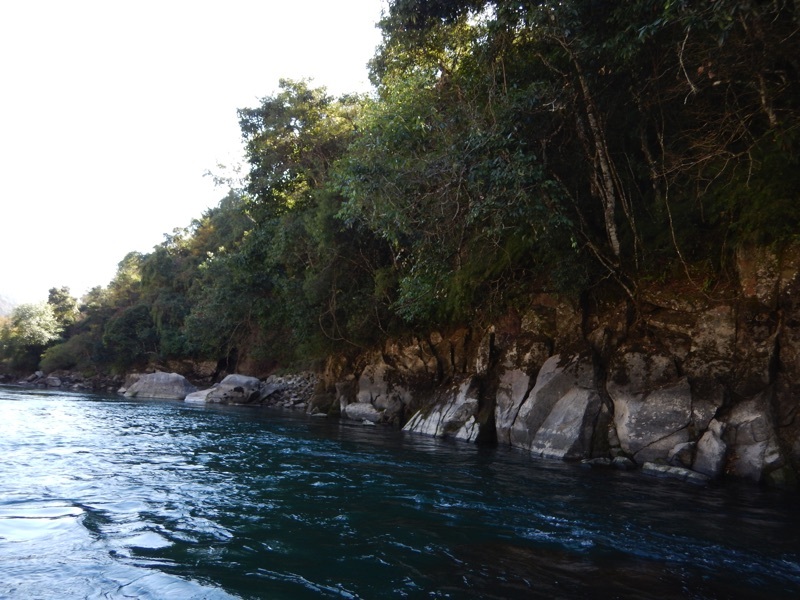 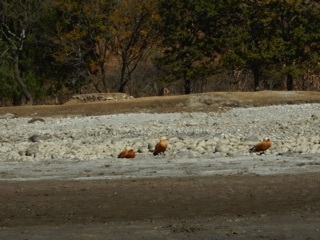 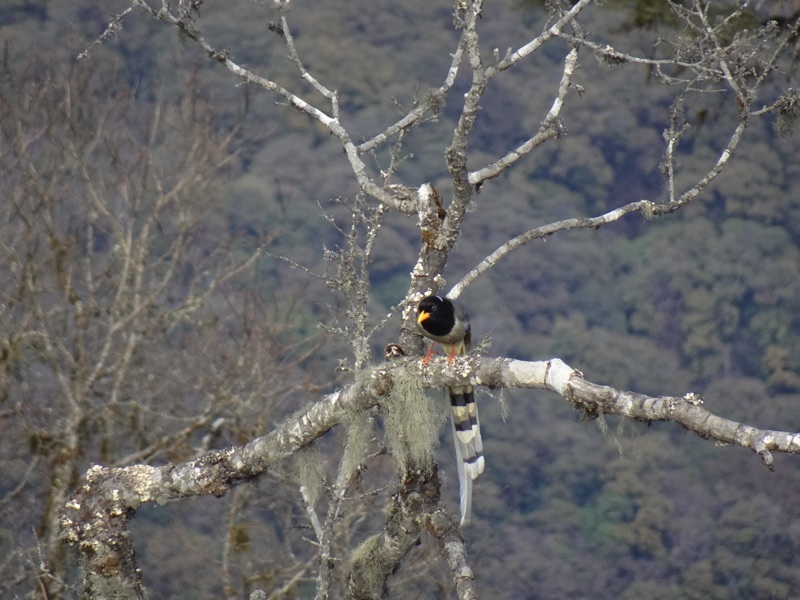 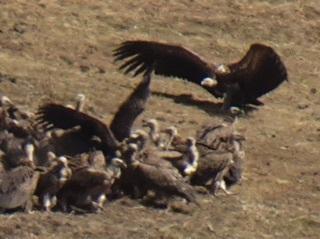 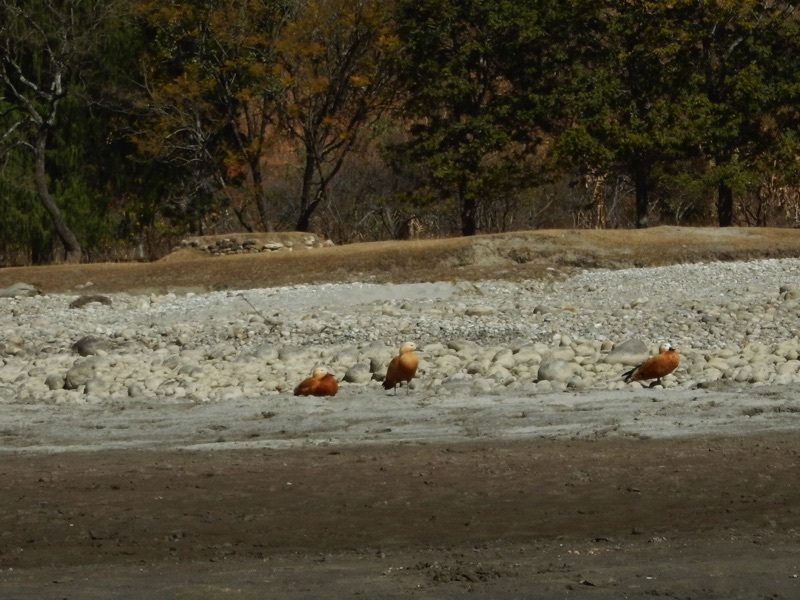 The high point of the trip was the Palla’s fish eagle that swooped over our raft and downriver. We watched this great gray bird in awe. 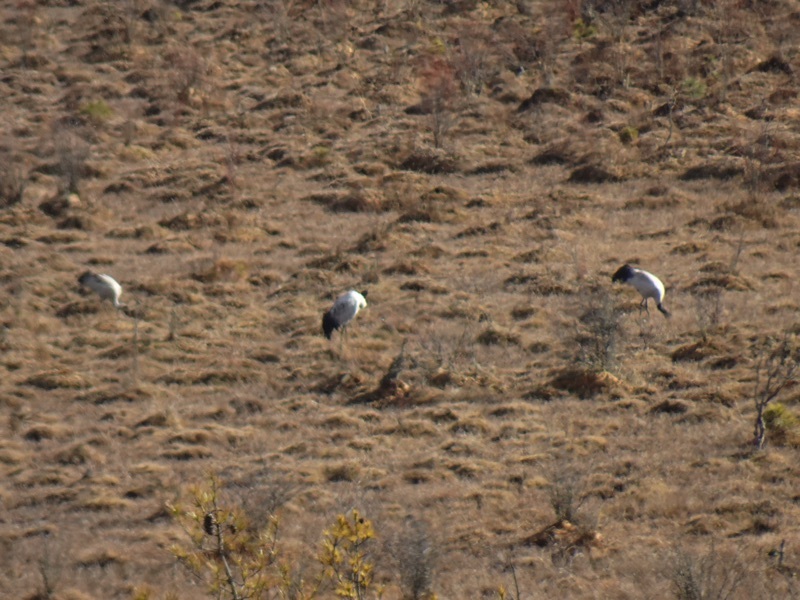 It was a rare sighting. 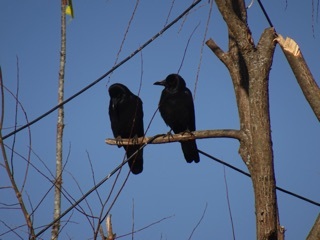 There was no way we were going to be fussing with cameras. We did take a few pictures of the more common and more cooperative ruddy shelducks. We had views of the snowy mountains whose meltwaters in which we were rafting. We passed prayer flags and shrines. 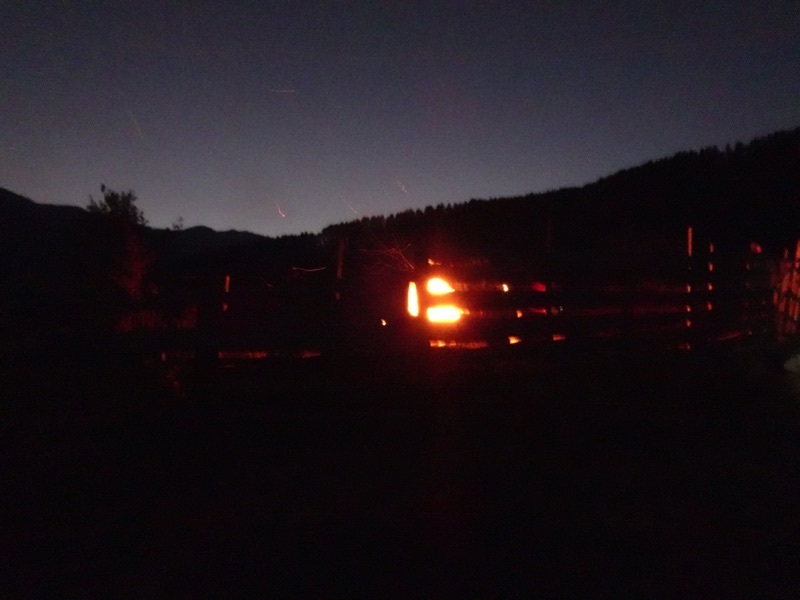 It was an amazing journey, and, for us, quite an adventure. Before our raft trip we took a short walk. The trail led to a shrine, but we didn’t make it that far. The river below was waiting for us. 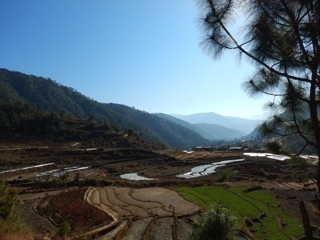 We did see the rice fields and had a glimpse of the distant snow covered mountains. 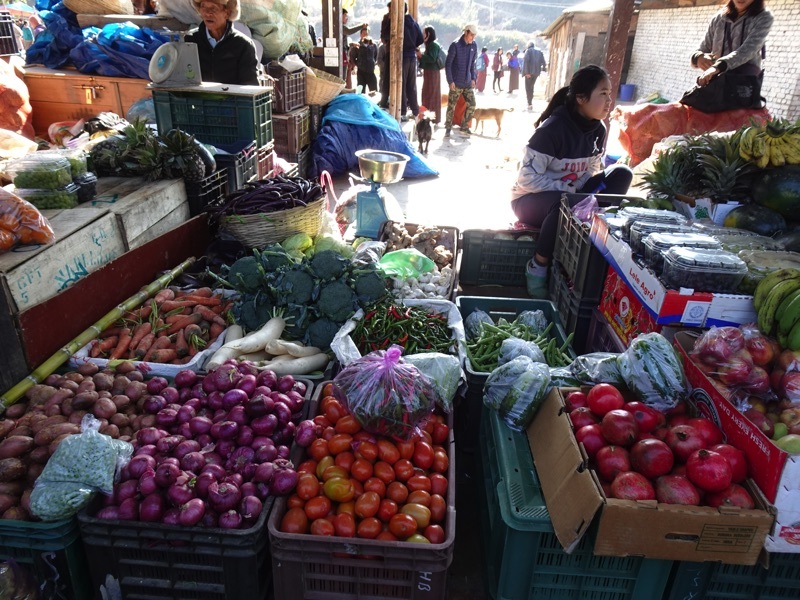 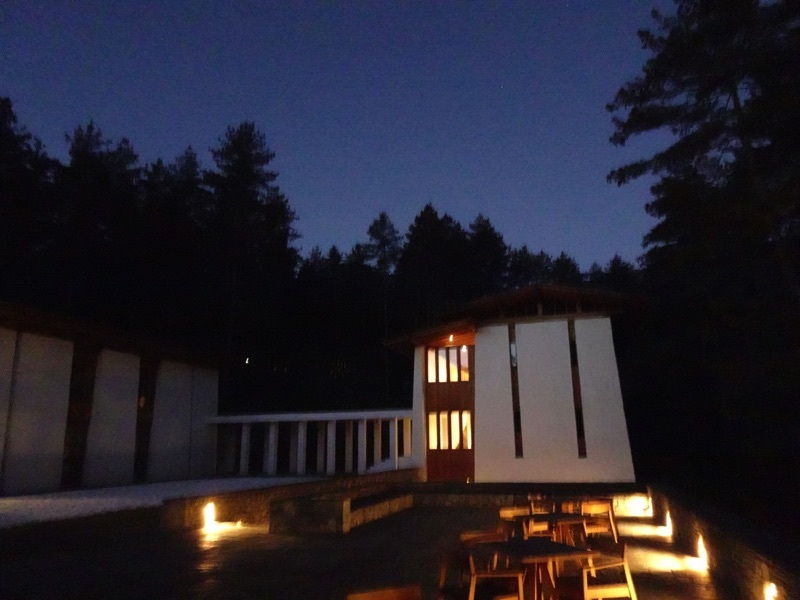 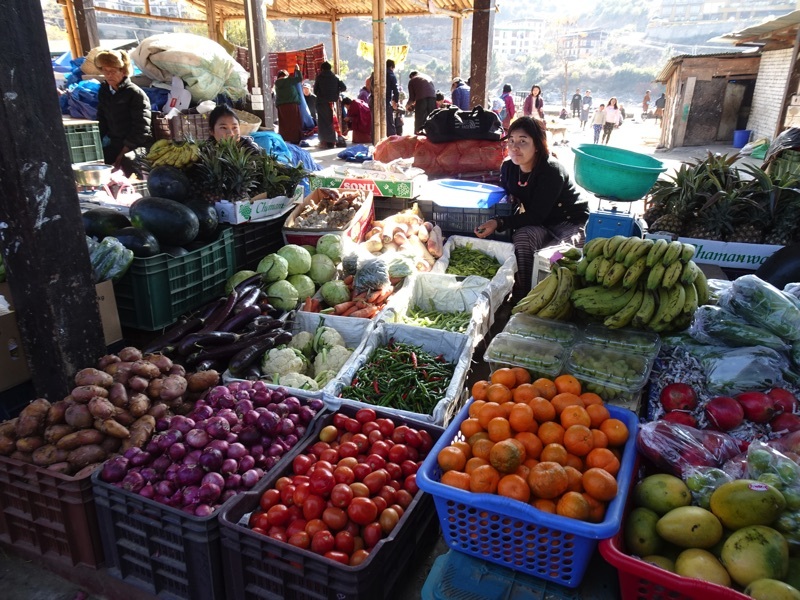 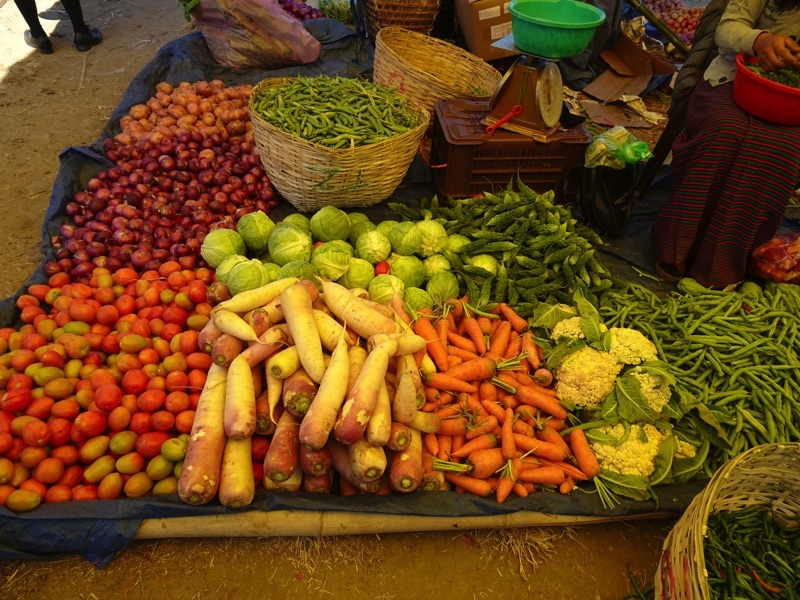 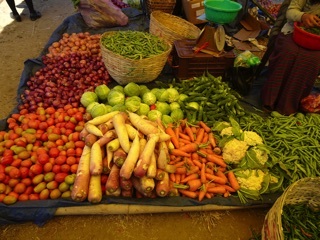 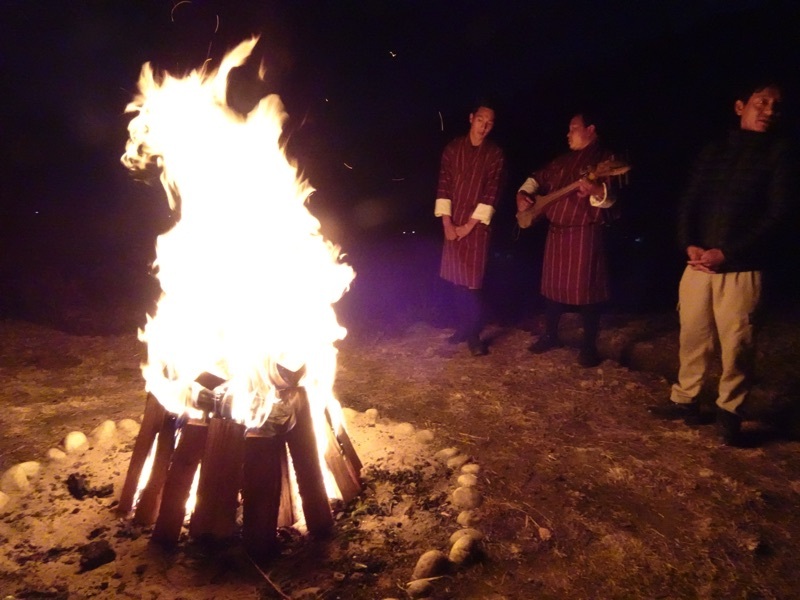 Punakha, as it turns out, is great for just about every variety of vegetable. 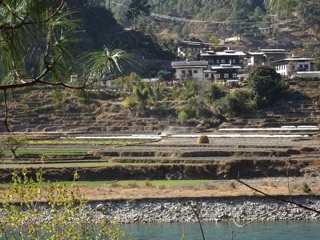 It also produces rice and winter wheat. 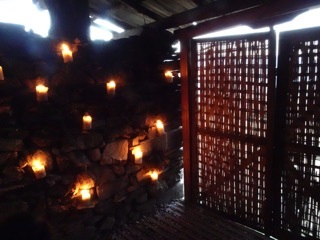 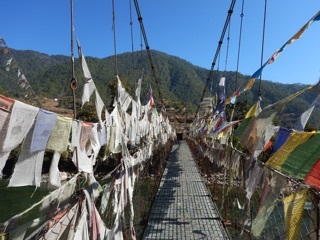 Across the bridge - We added our own prayer flags. 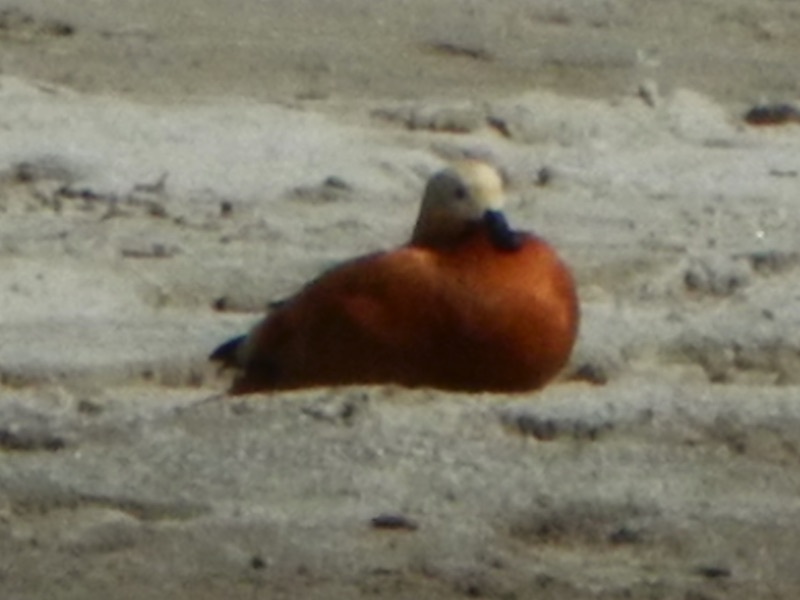 We’ll update this when we look this bird online. 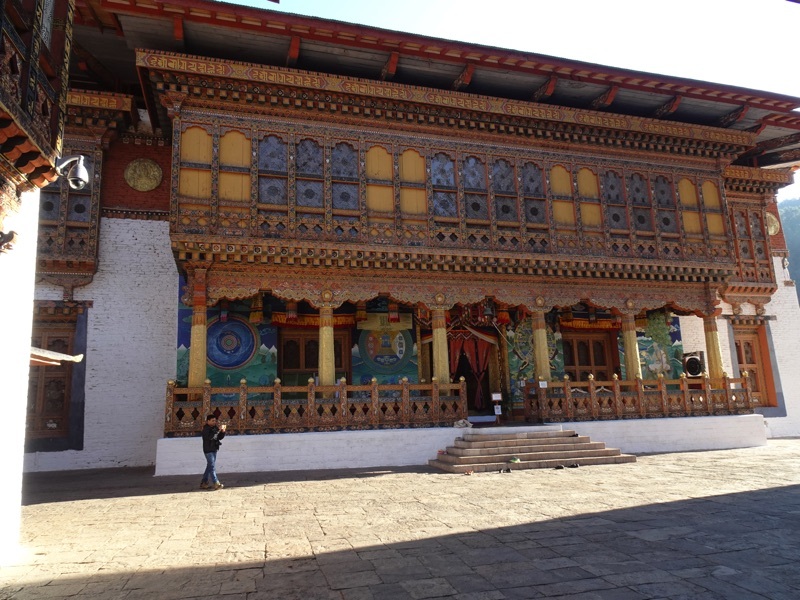 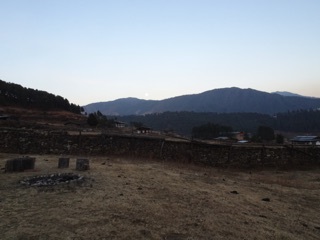 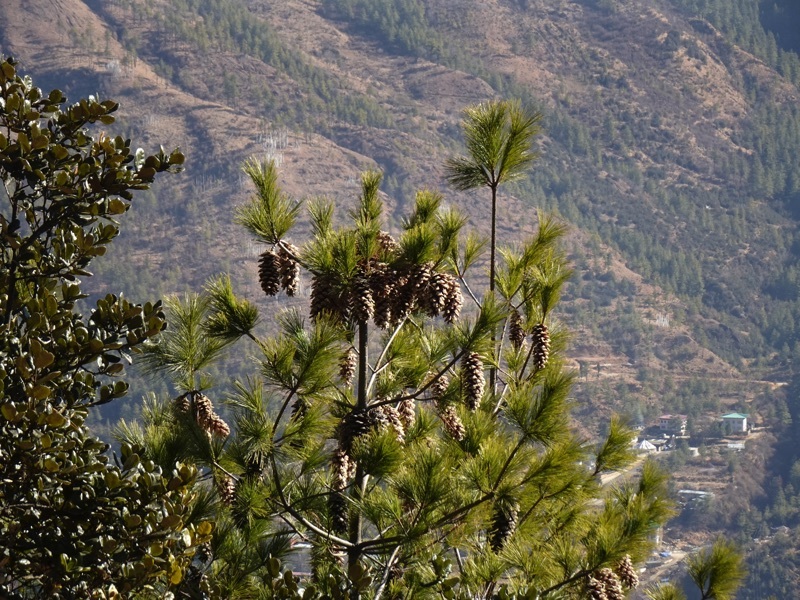 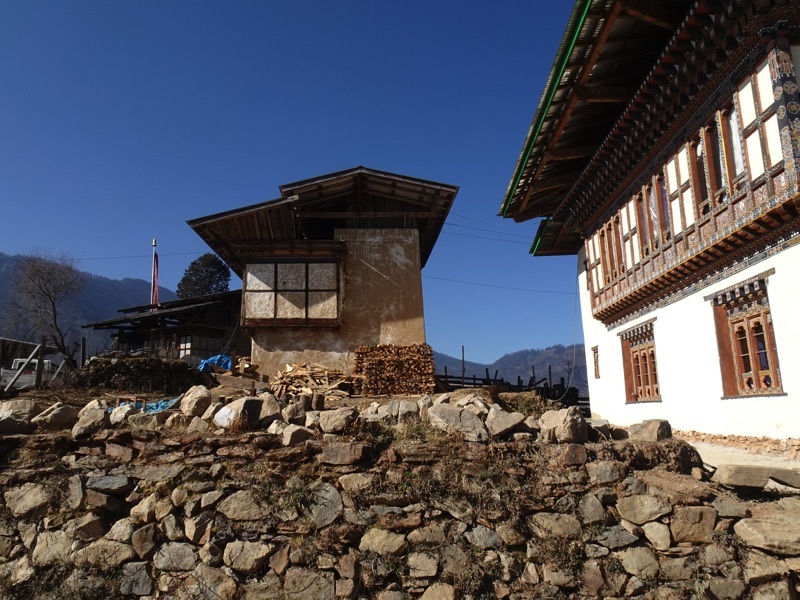 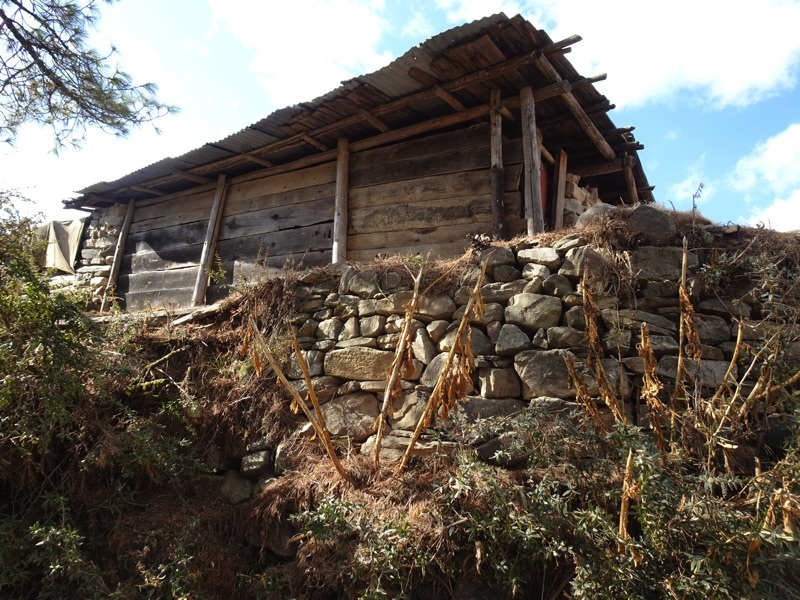 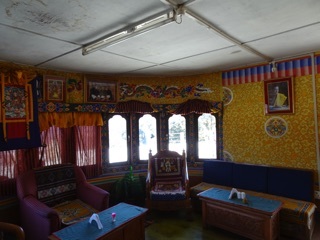 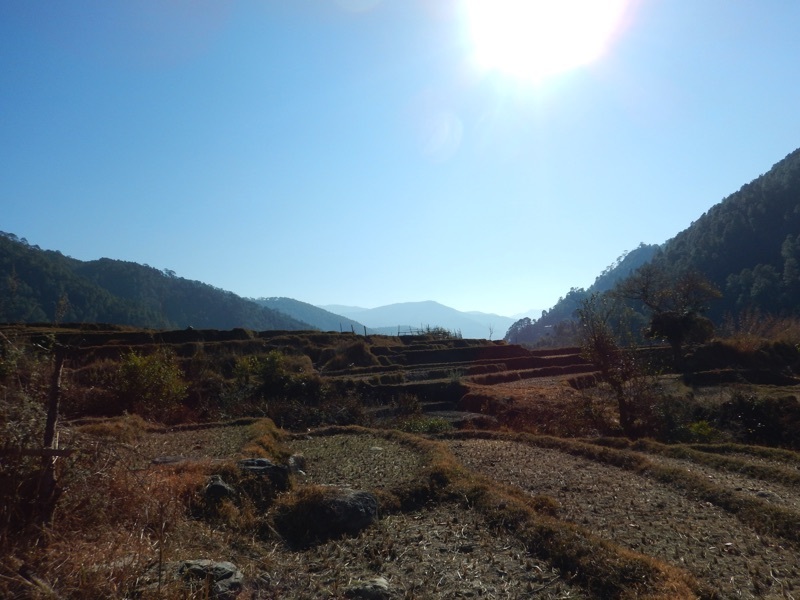 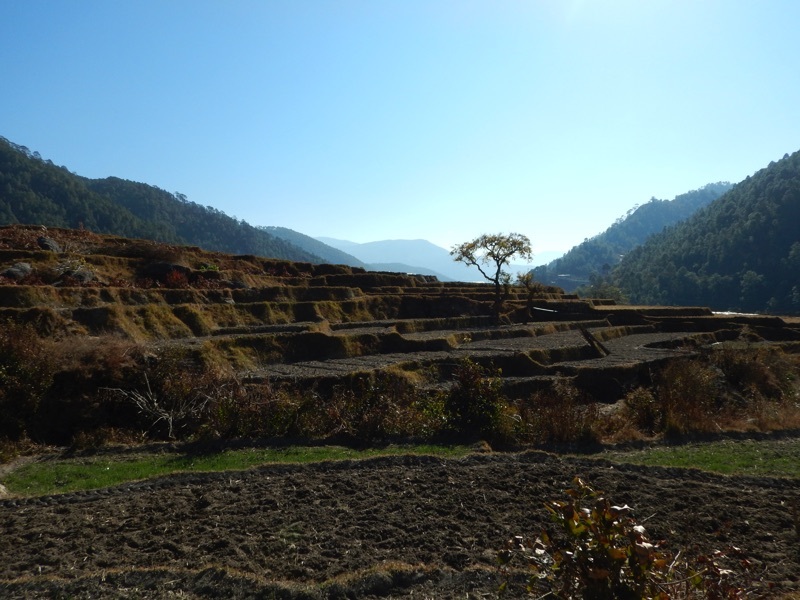 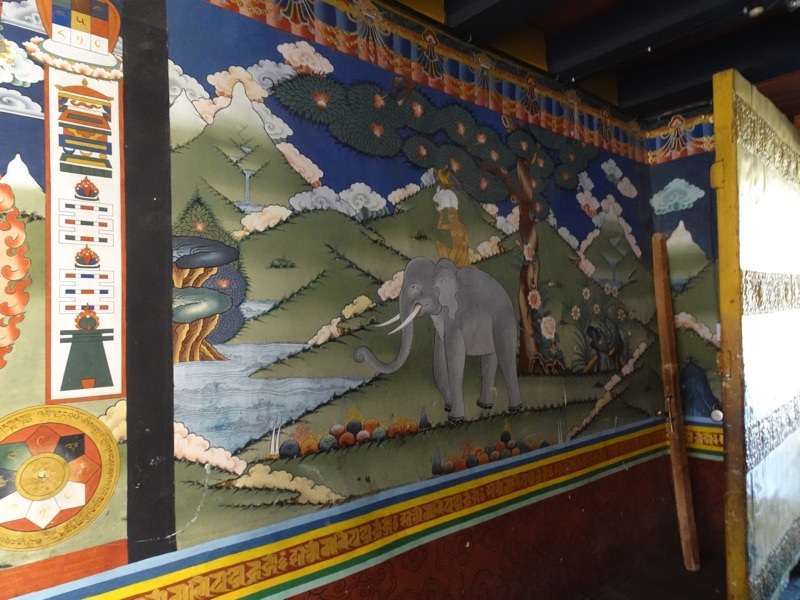 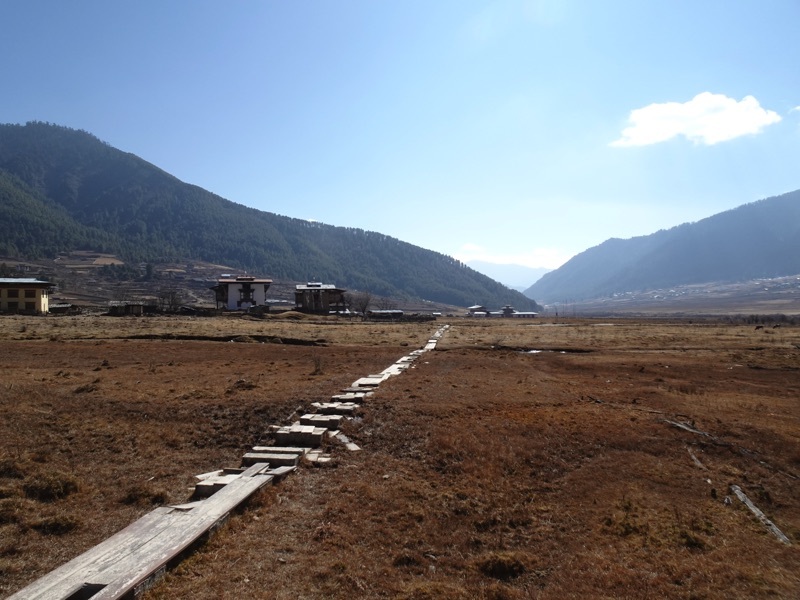 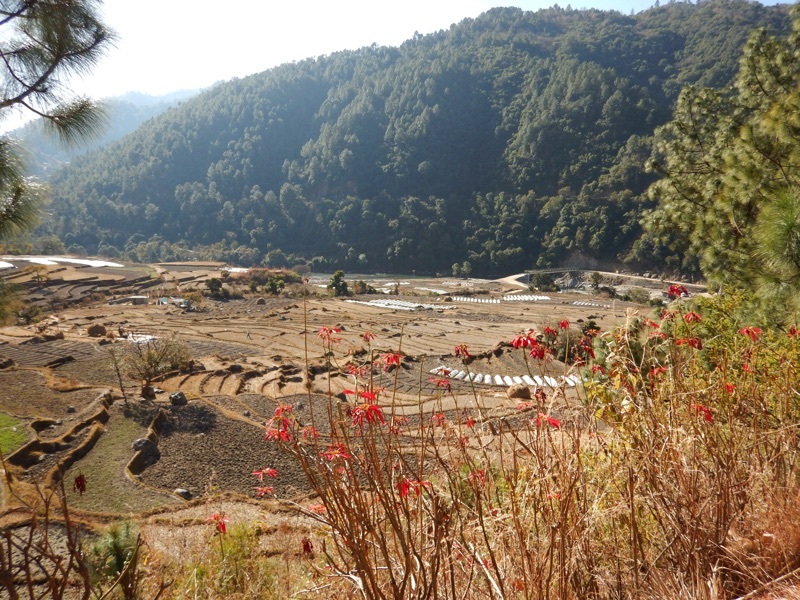 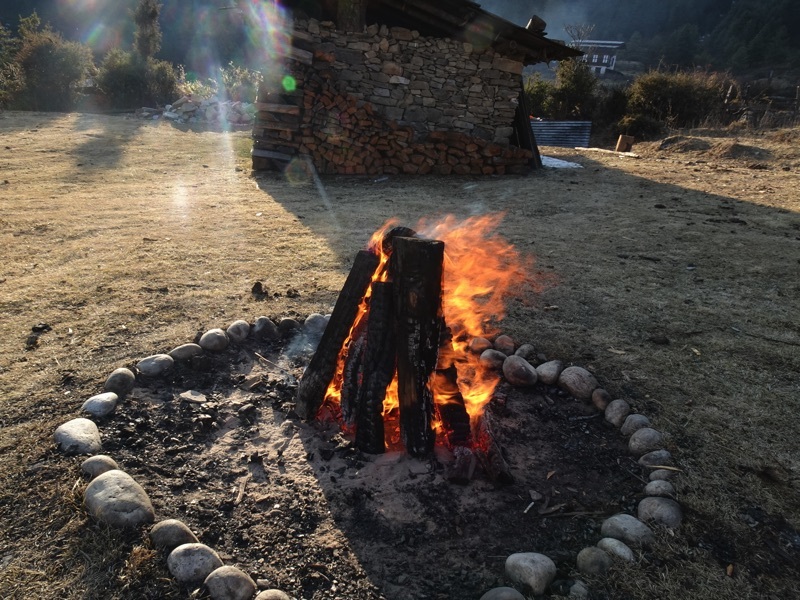 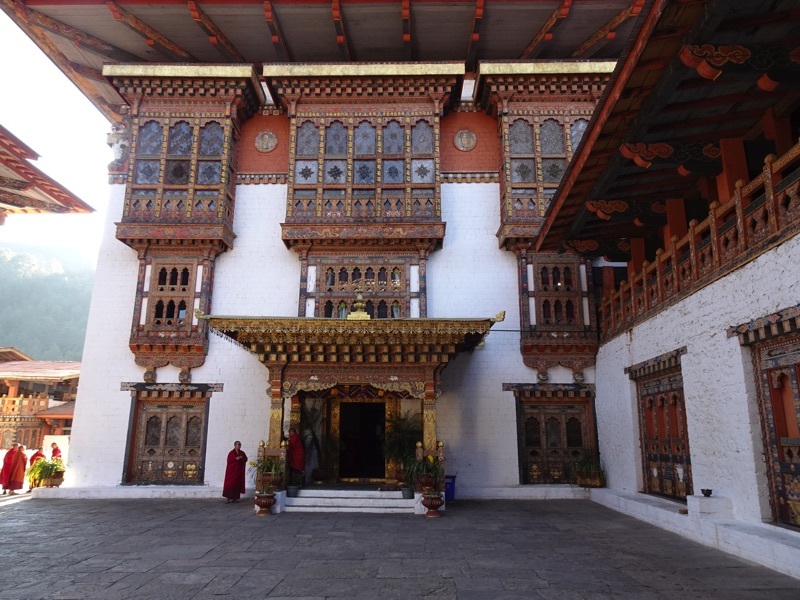 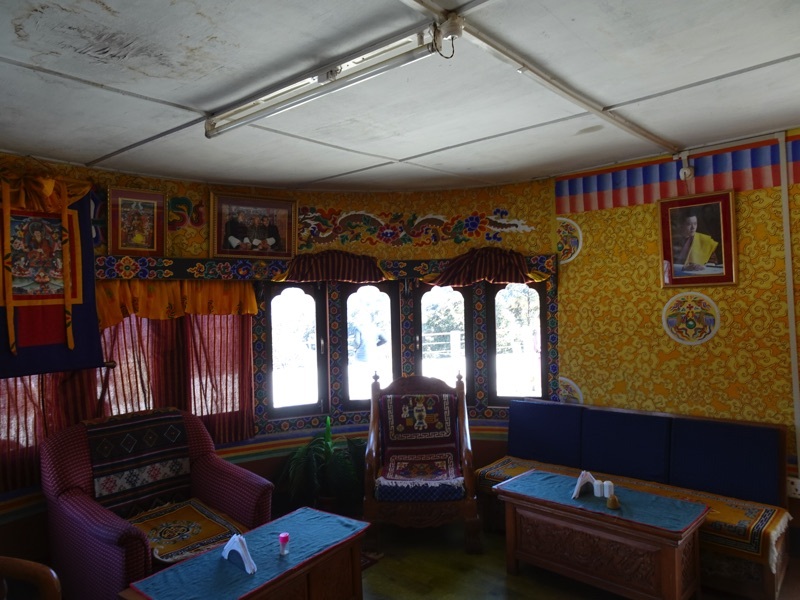 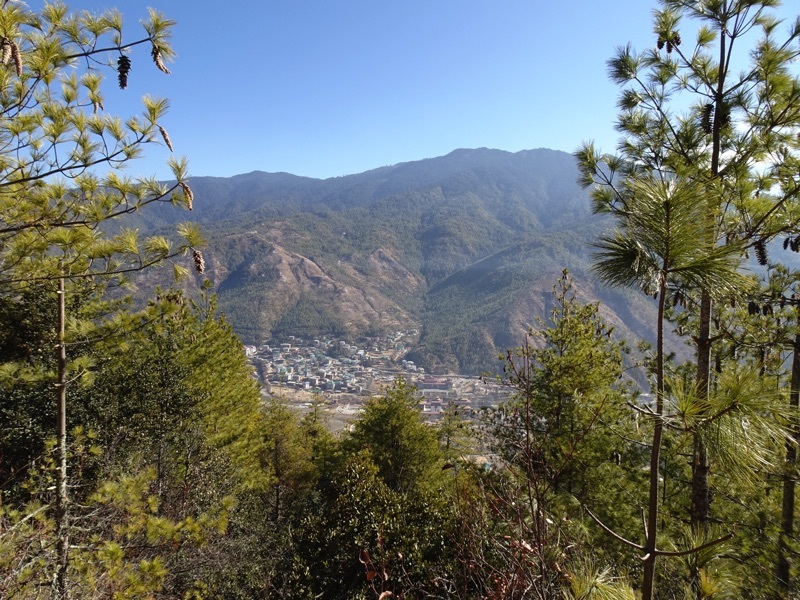 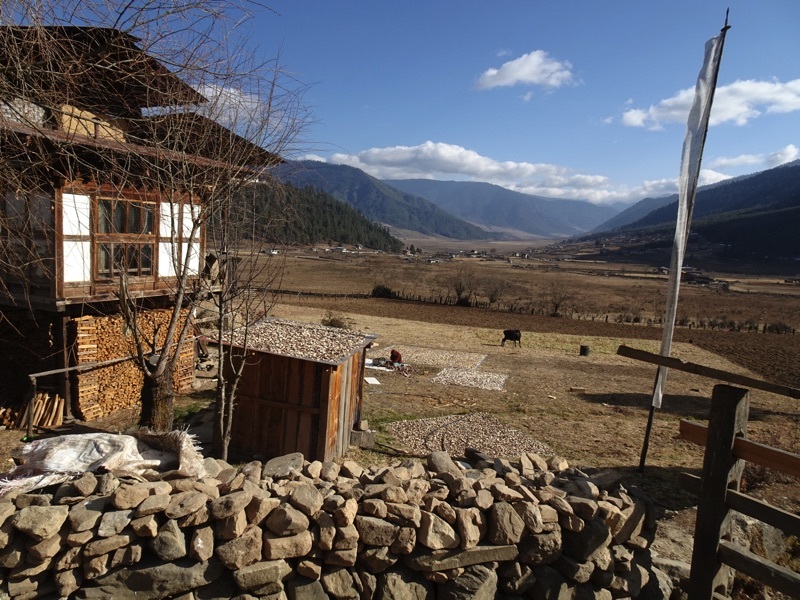 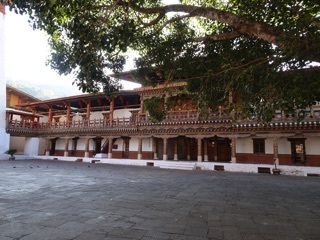 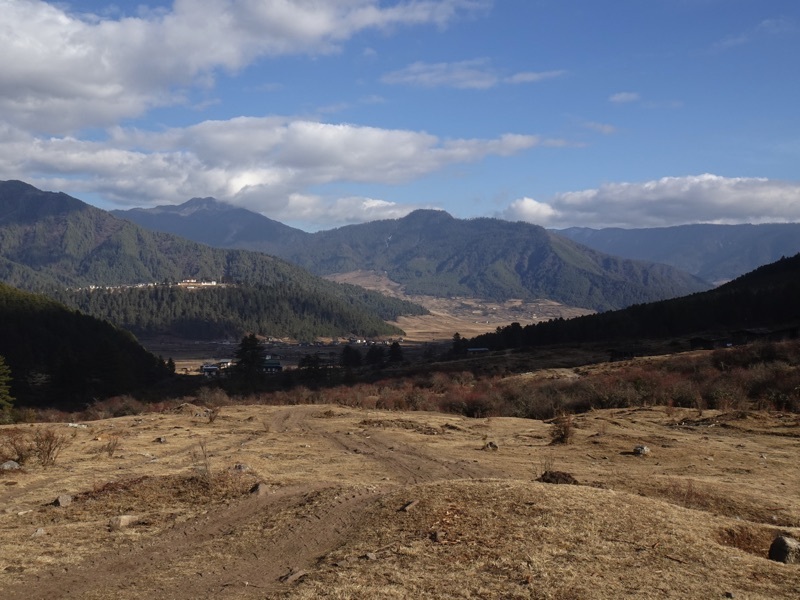 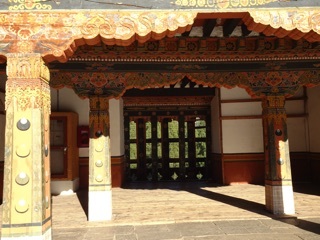 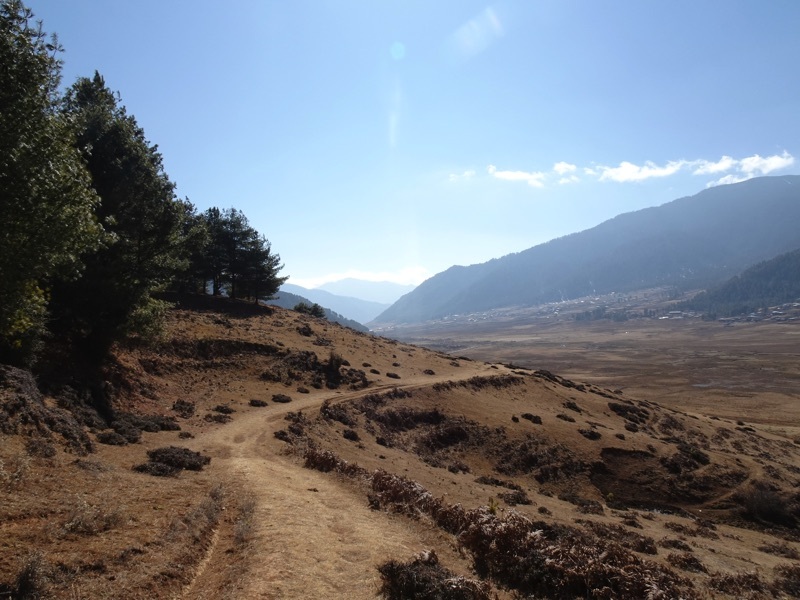 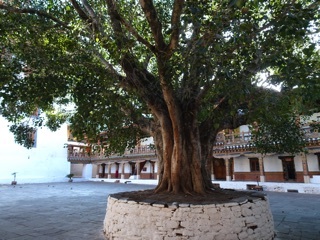 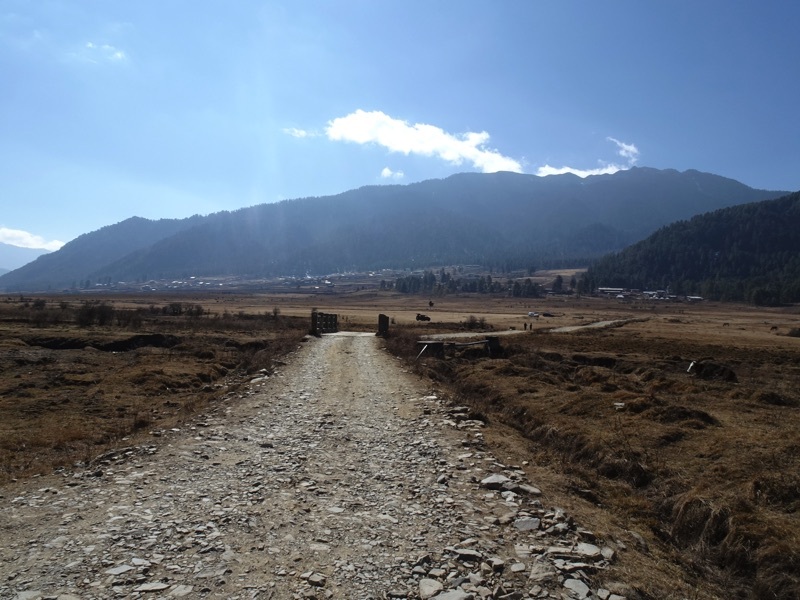 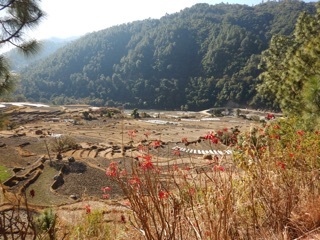 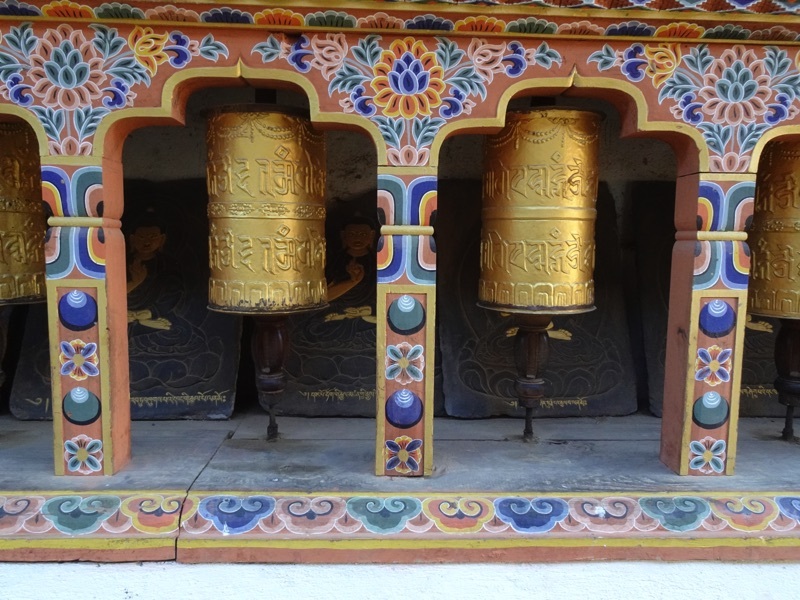 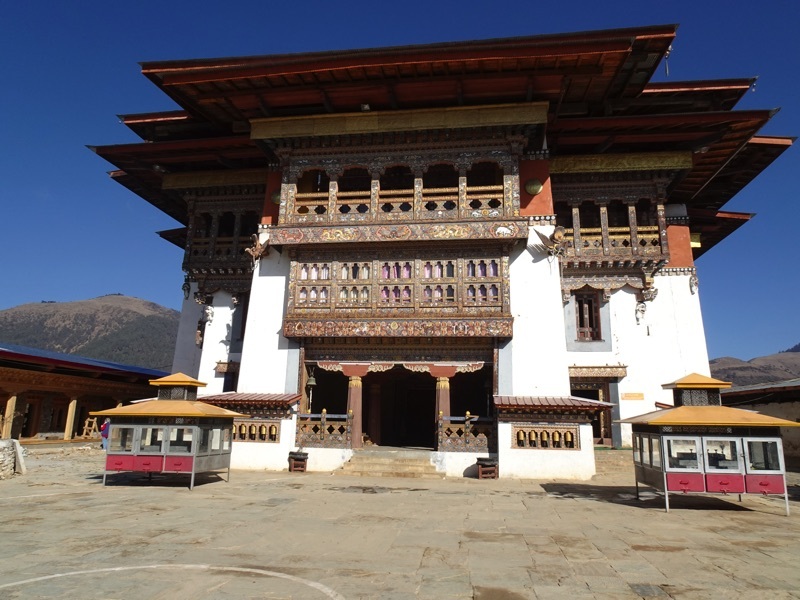 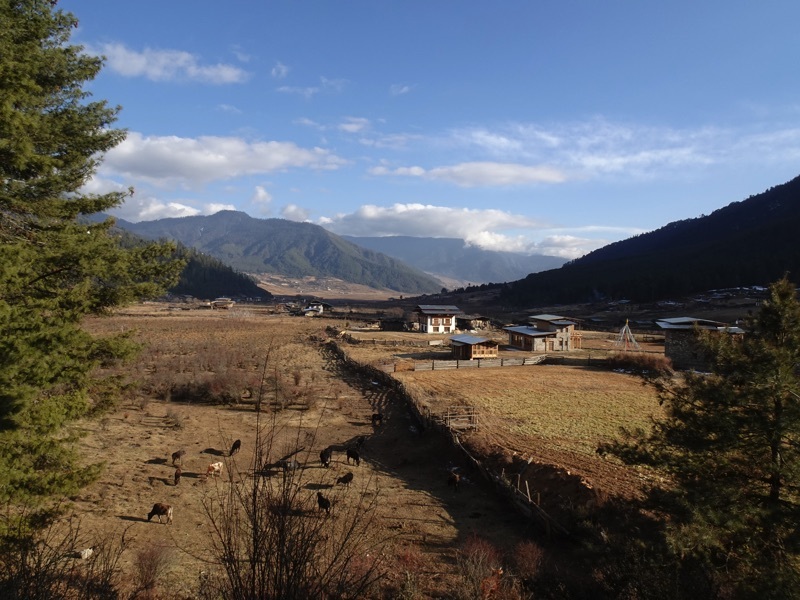 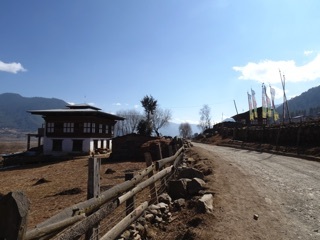 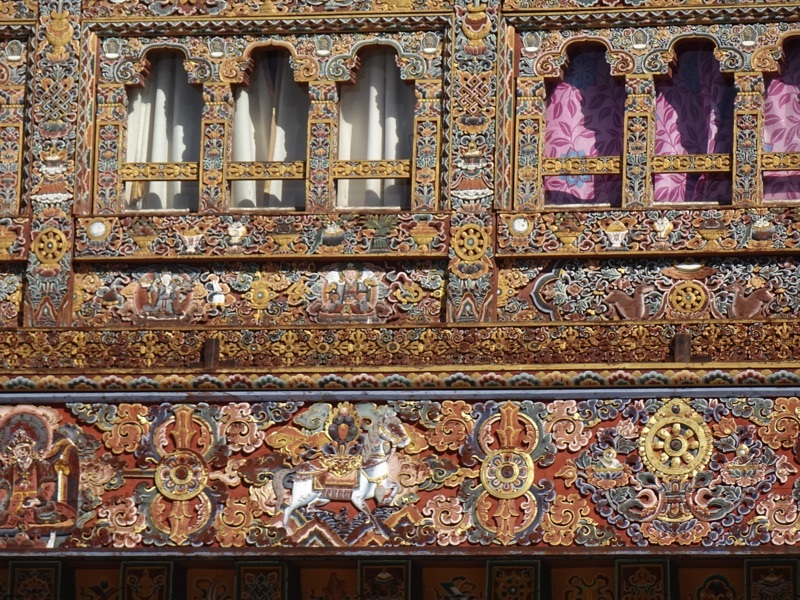 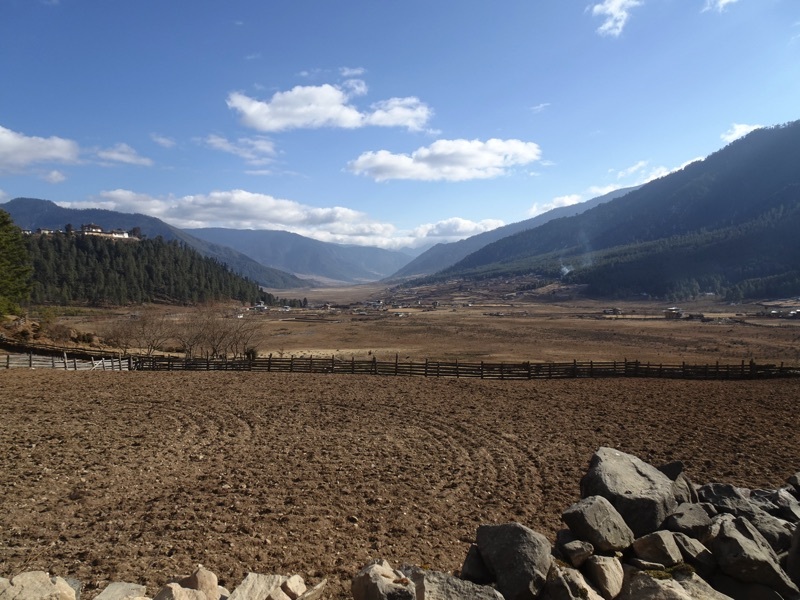 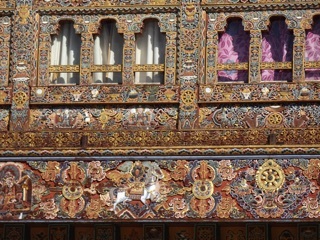 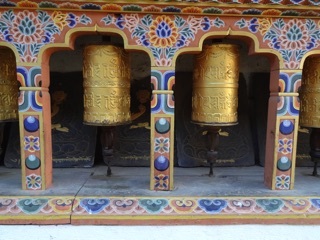 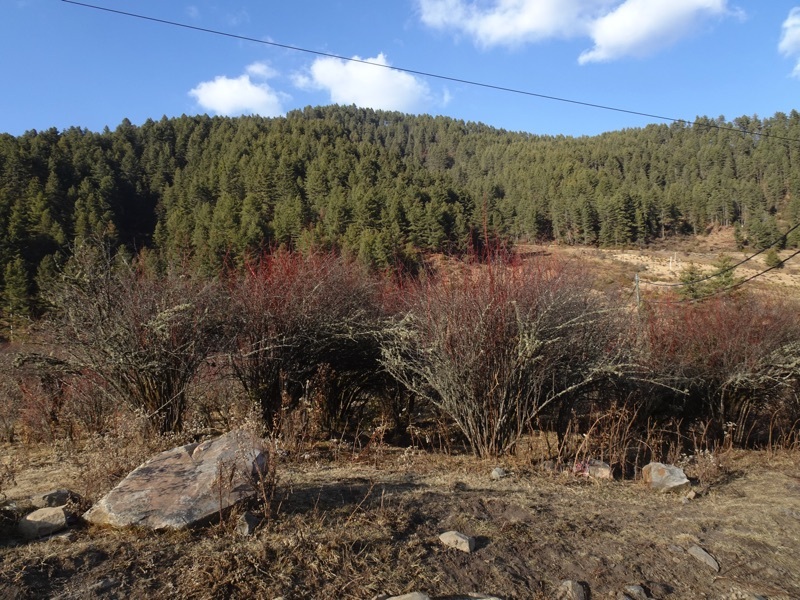 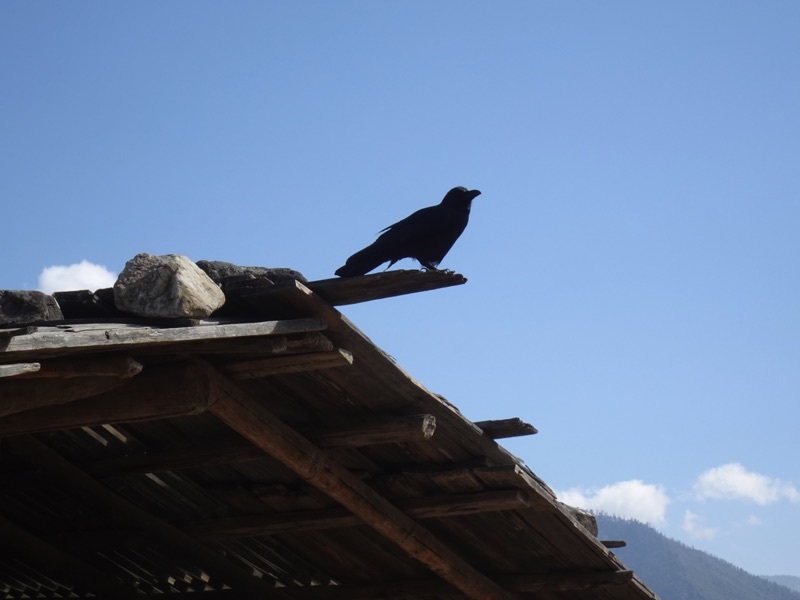 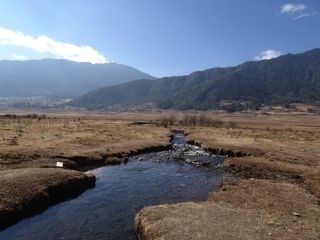 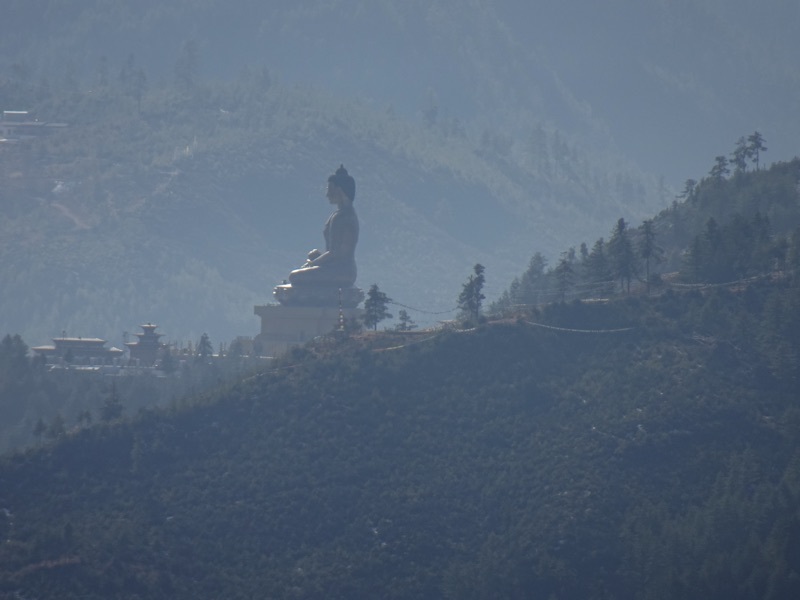 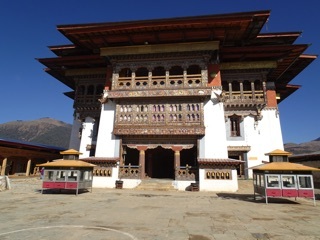 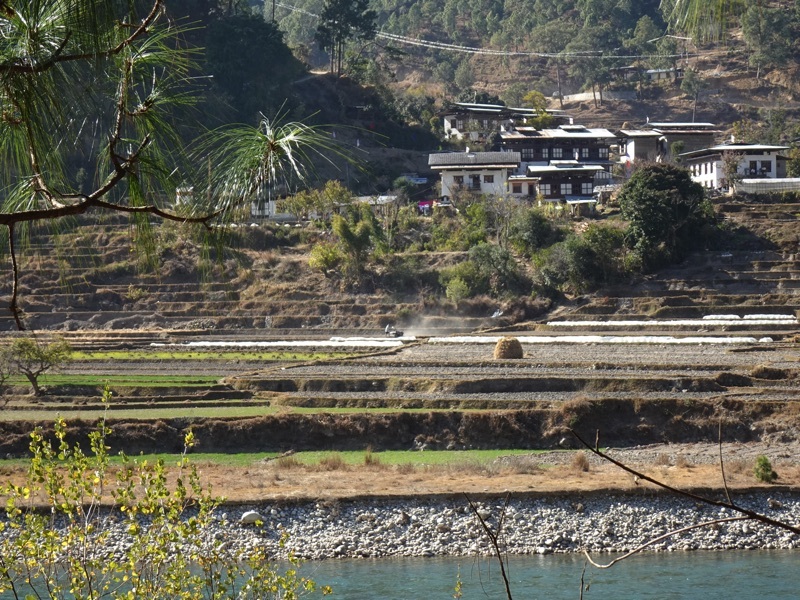 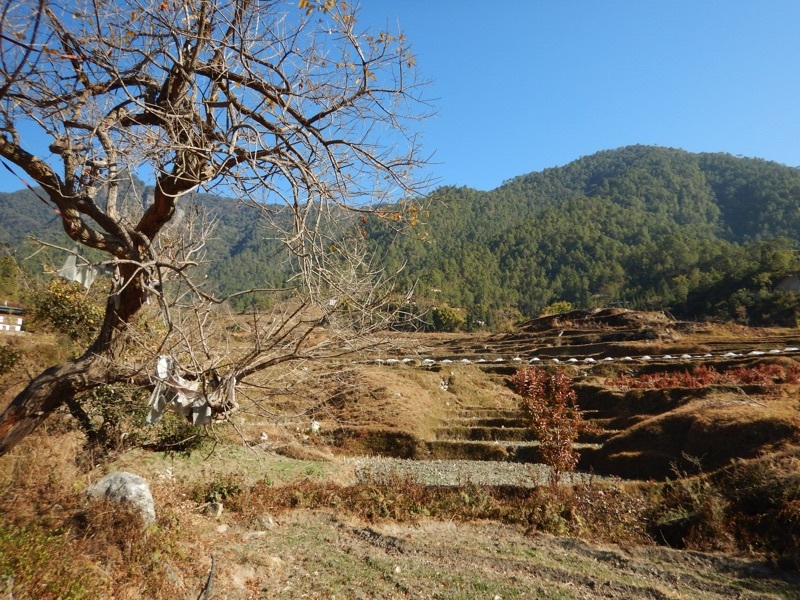 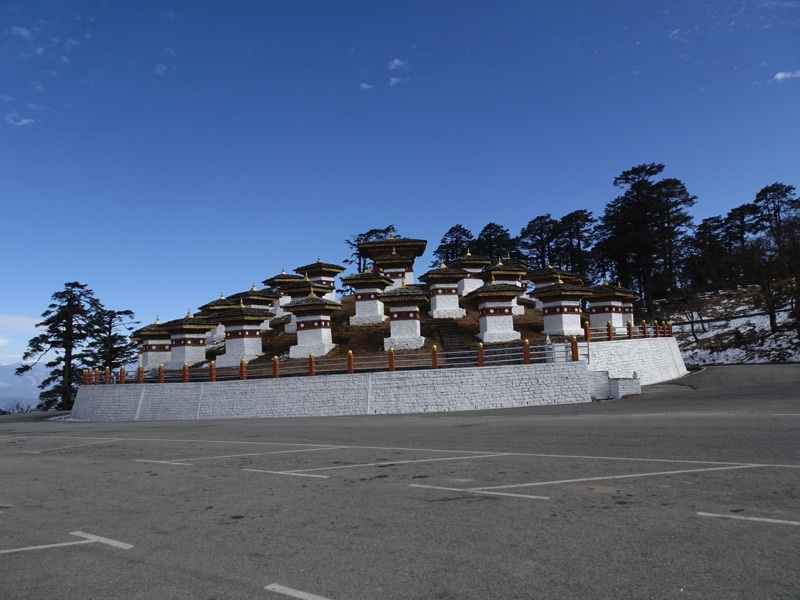 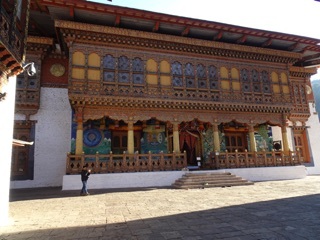 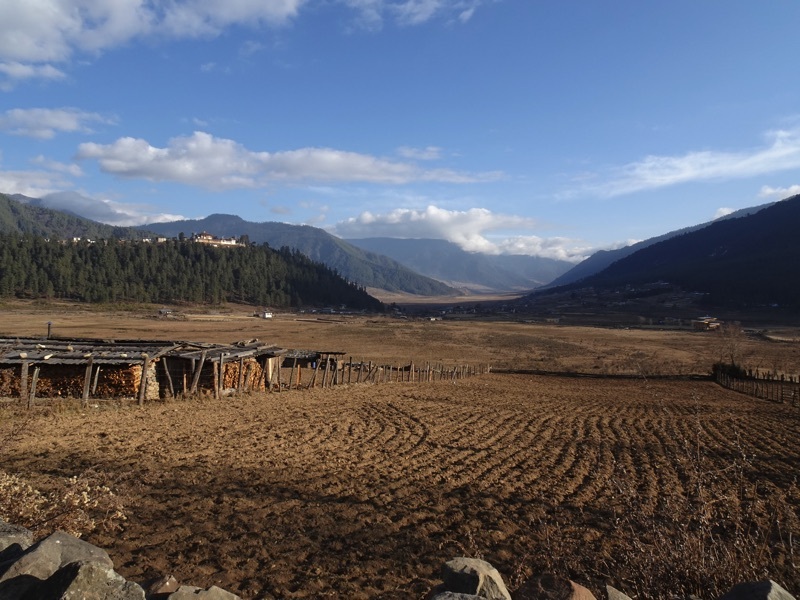 We headed east from Thimpu, over the mountain pass to the next valley and the city of Punakha. 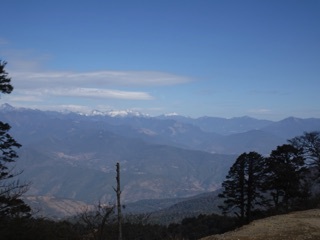 We stopped at the pass for a view of the high mountains beyond, capped with snow. Then we descended into the mild valley. 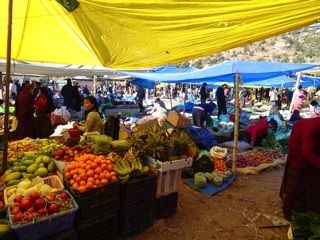 Even in January, there were oranges, spinach and other vegetables on sale at the little farm stands we passed. 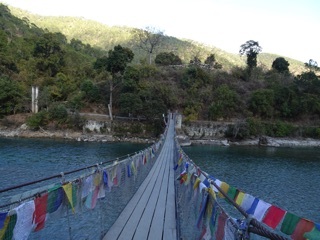 That afternoon, we crossed the suspension bridge over the Female River to our hotel. 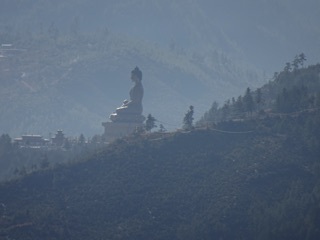 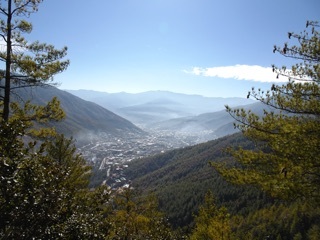 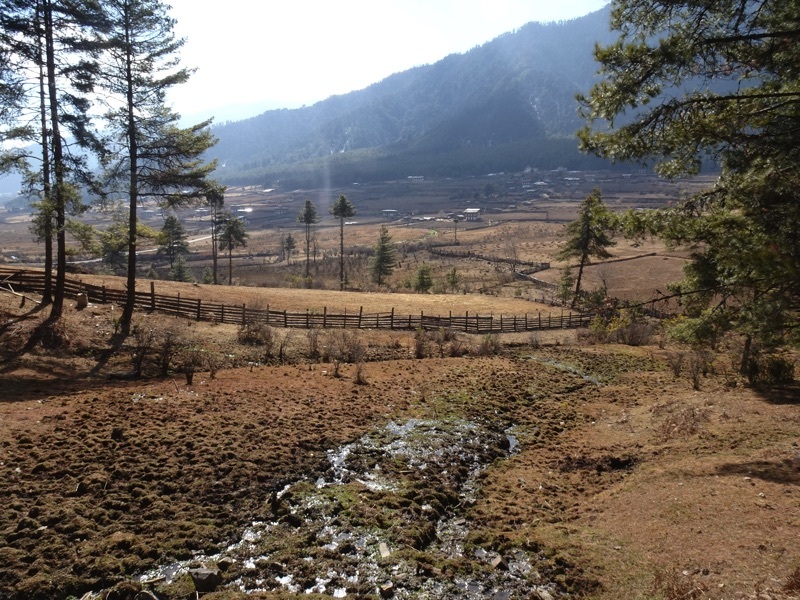 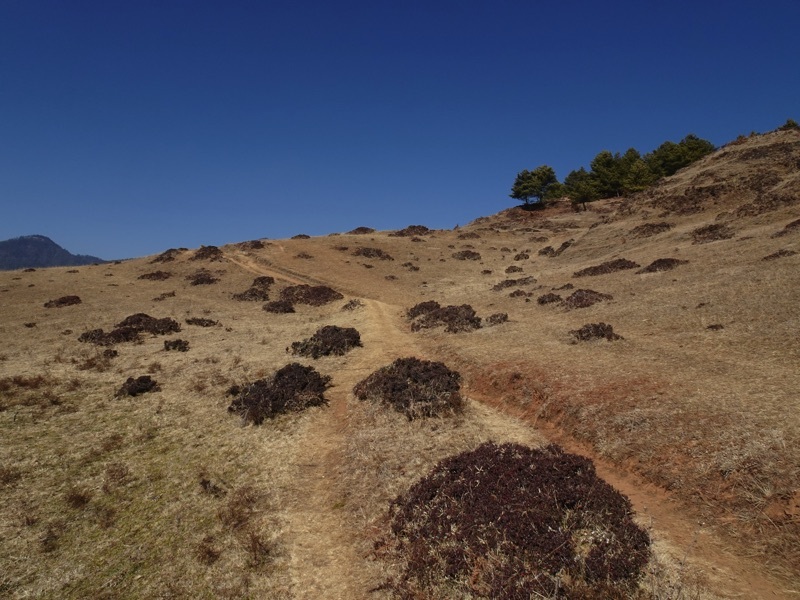 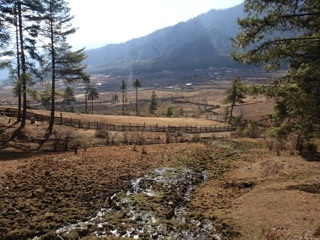 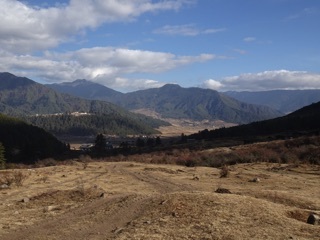 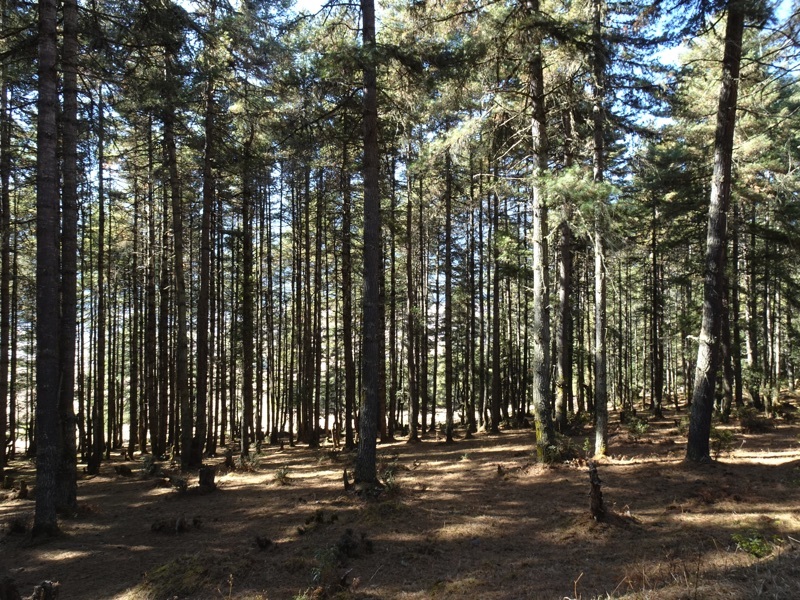 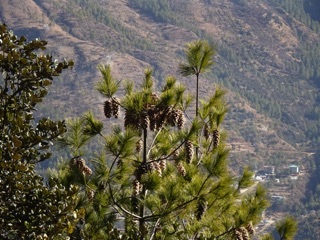 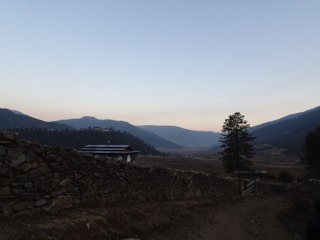 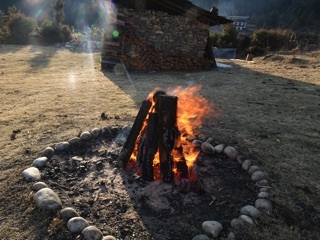 Having been in an airplane for days on end, we went for a short hike on our first morning in Bhutan. 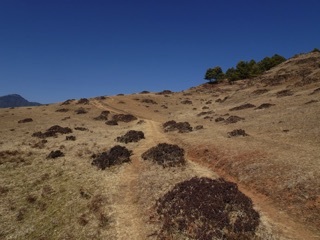 It was a short trail not far from our hotel. 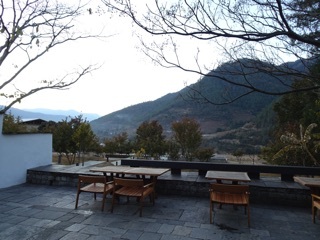 We walked to a shrine overlooking the valley. 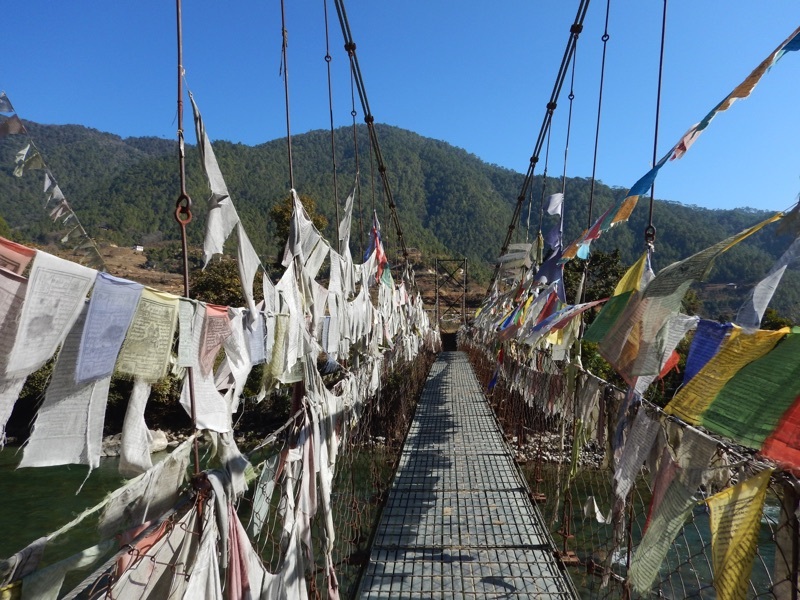 There were prayer flags all about. The white ones commemorated the dead. 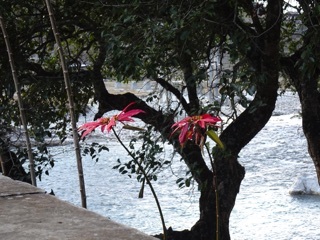 The more colorful ones were for the living. 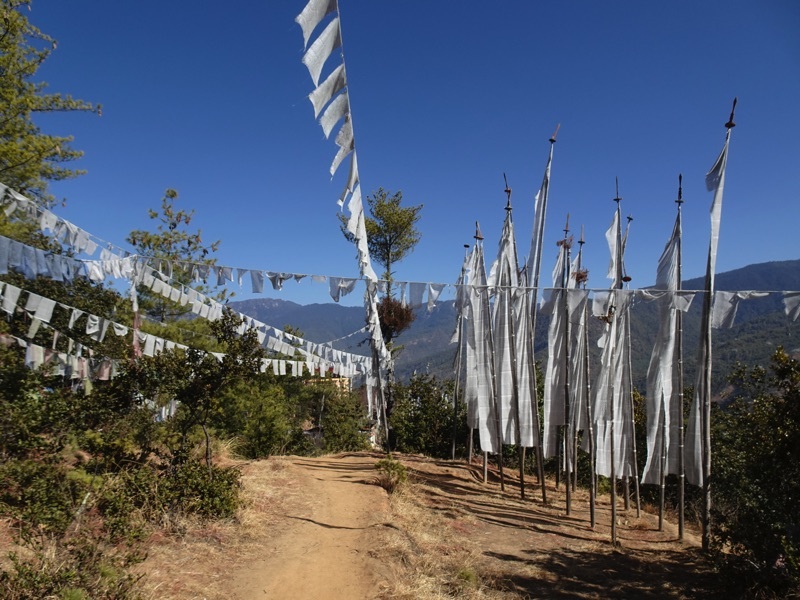 The prayers were as if recited when moved by the wind. 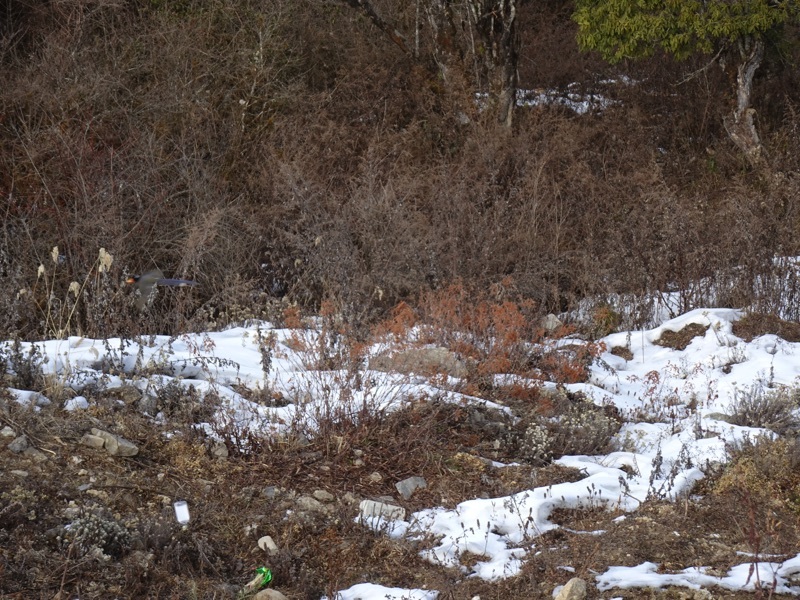 We knew we weren’t in Thailand anymore. 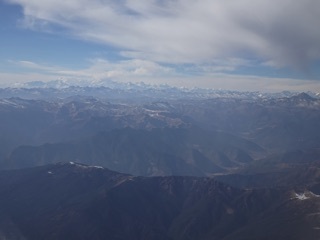 Those mountains were huge. 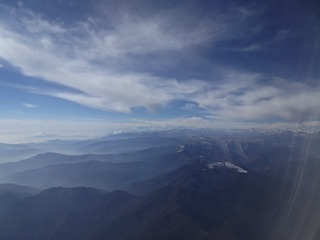 We had been flying north for over two hours. 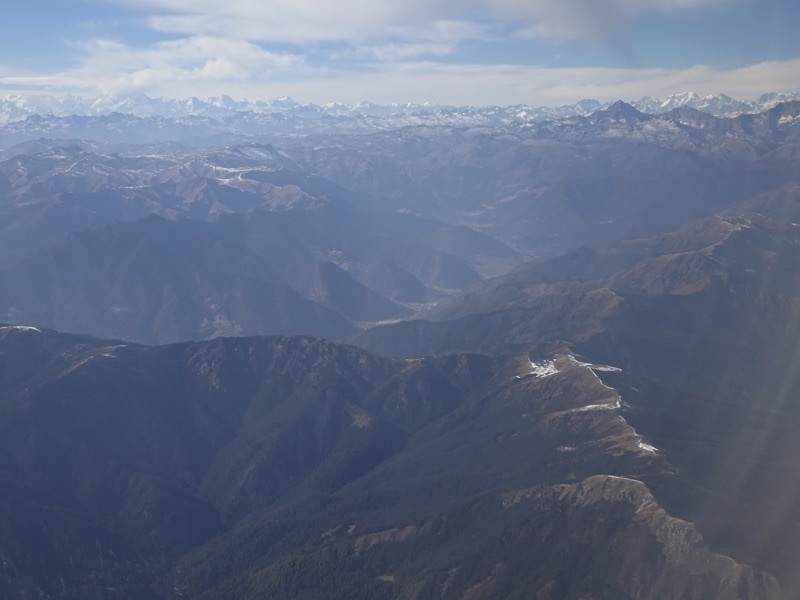 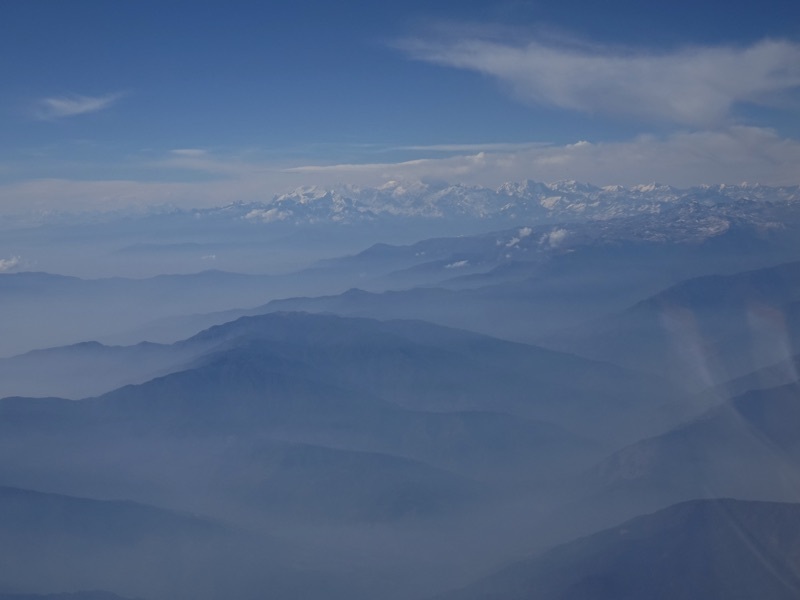 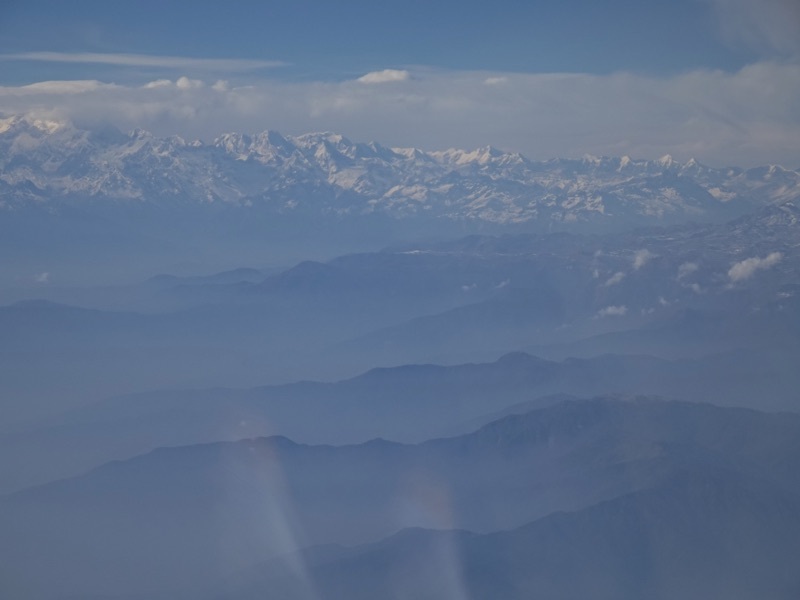 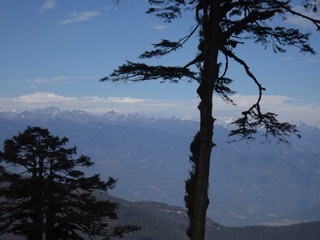 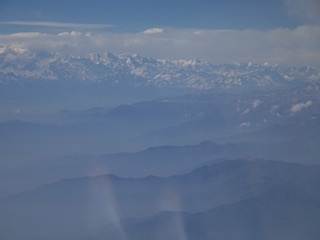 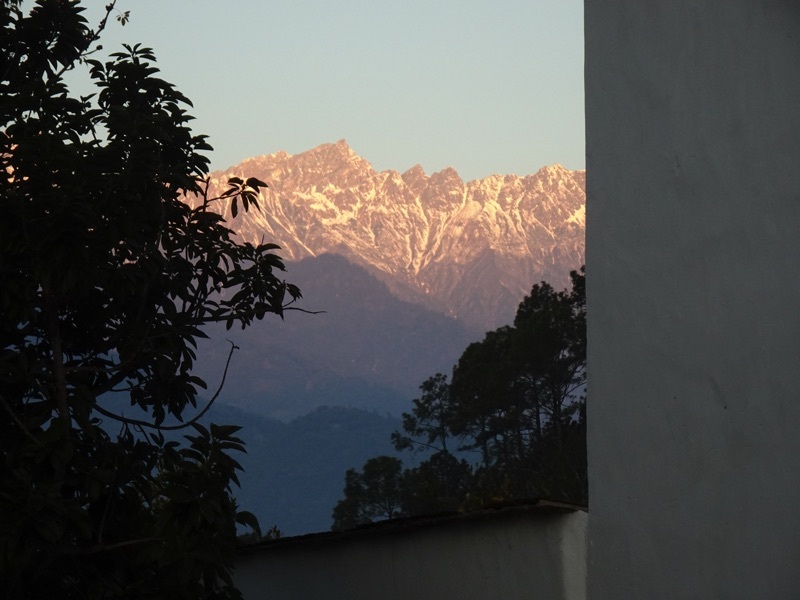 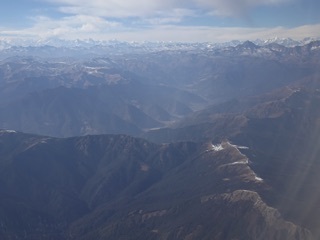 Now we were coming into the place of the snow, the Himalayas. 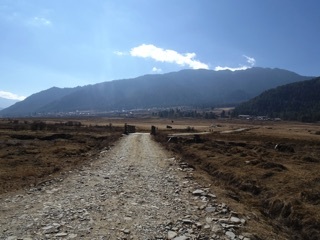 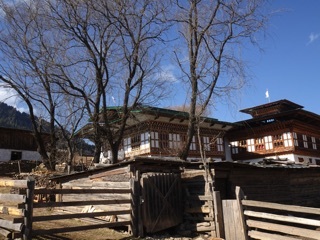 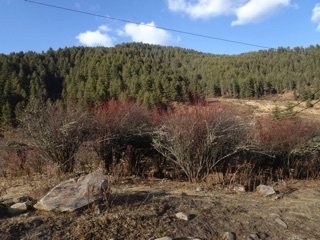 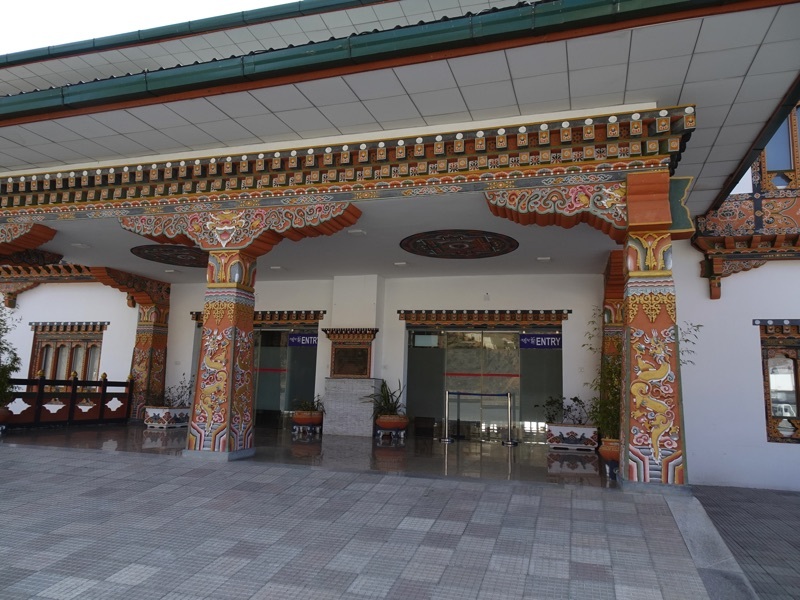 Our destination was Bhutan. 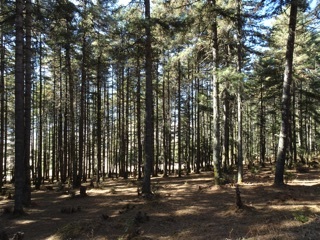 We aren’t in Port Angeles anymore either. 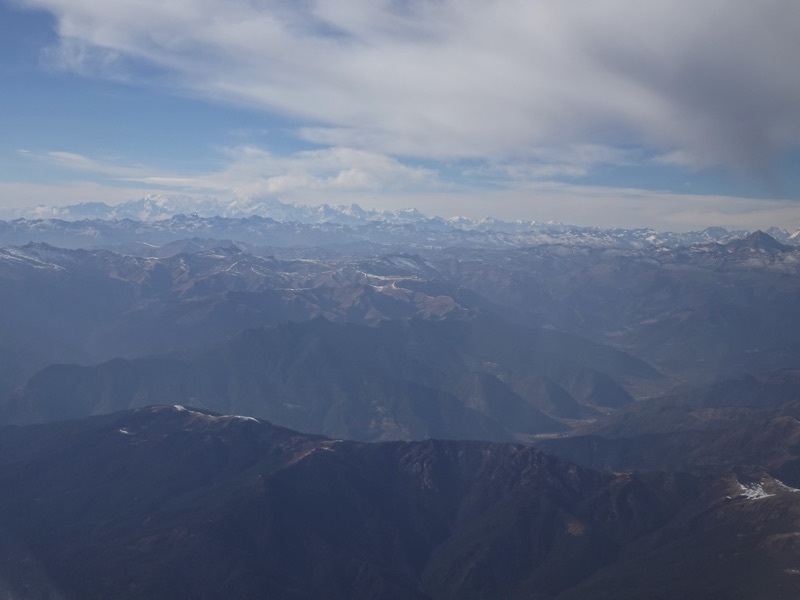 We were at 34,000 feet, and those mountains didn’t look flat.